Hiyama castle (檜山城) is located at Kiriyama mountain, one of 150 meter height at 5 kilometer southeast from central Noshiro city. 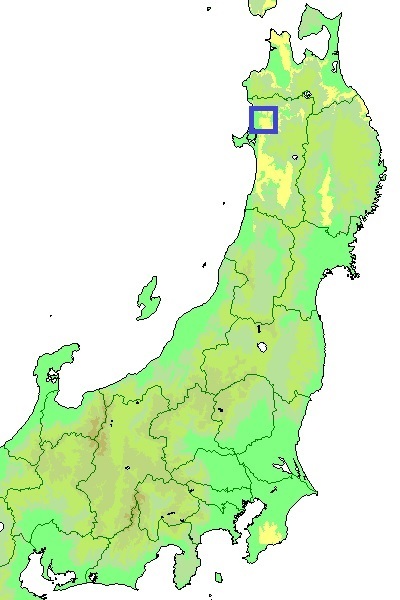 Noshiro city is a center of north part of Dewa province (Akita prefecture) at the mouth of Yoneshiro river, and a meeting point of maritime transportation at Noshiro port and Ugokaido road toward Hirosaki area of Mutsu province (Aomori prefecture) through Odate city. 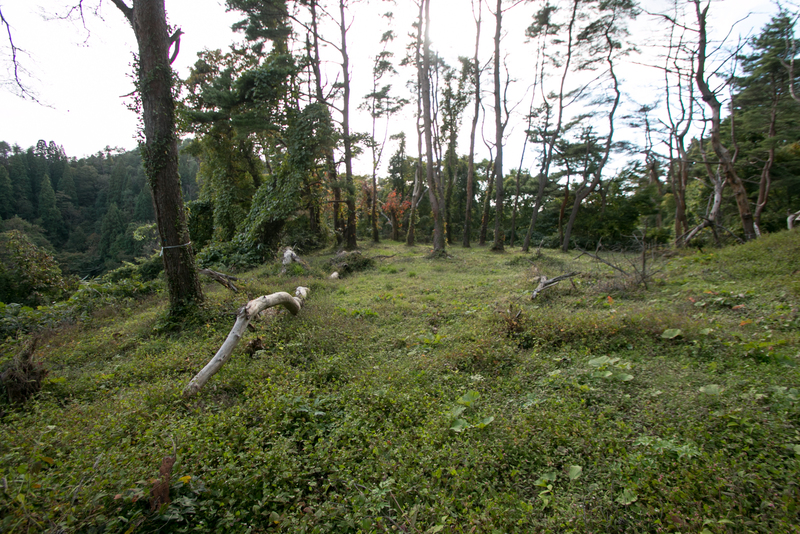 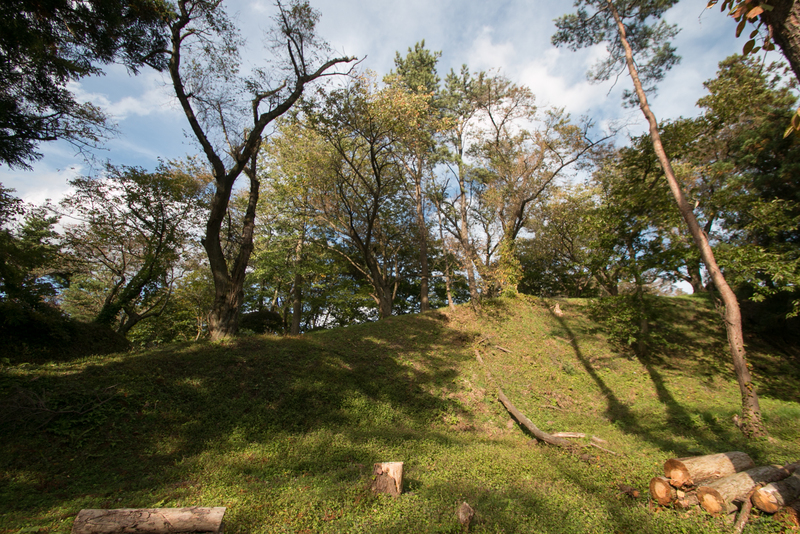 The place of the castle is applicable to the corner of right angle shaped mountain areas formed by Yoneshirogawa river and Noshiro plain. 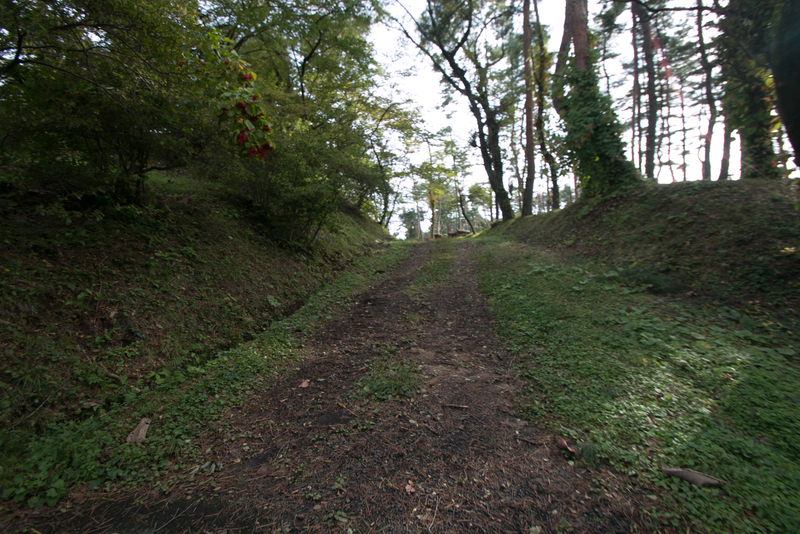 It is said that Hiyama castle was built by Tadasue Ando (?-1511), the leader of Hiyama Ando clan in 1495. 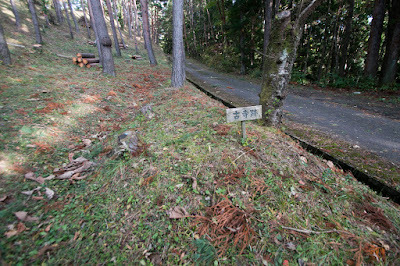 Origin of Ando clan is unknown but it is said as a descendant of indigenous people of Tohoku region. 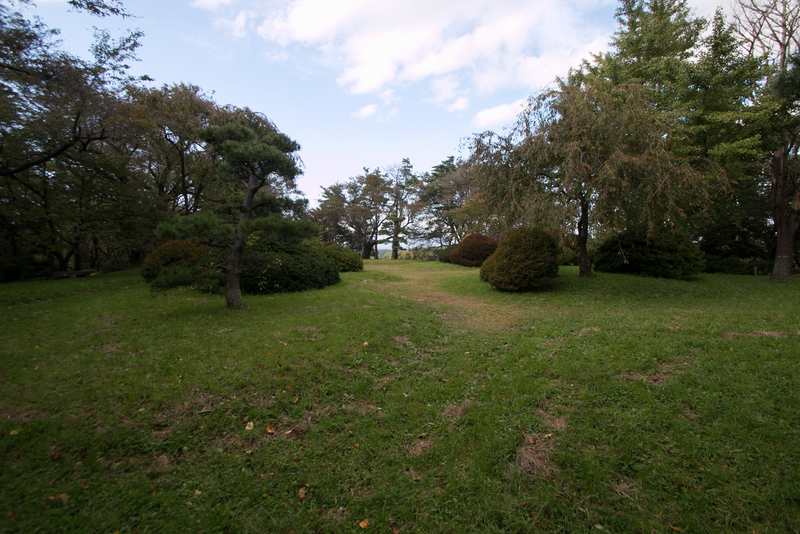 It is said that Ando clan was a leader of sea clan which engaged in fishery and marine transportation around Tohoku region and south part of Hokkaido island. After the fall of Oshu Fujiwara clan which dominated Tohoku region in 1189, Kamakura Shogunate sent their retainer to the region, but appointed Ando clan as the governor of Hokkaido island called as "Ezo island" at that time and let them govern current Mutsu peninsula and Oshima peninsula at both side of Tsugaru straight. In Muromachi era, Ando clan survived the conflict between two Imperial Household and prospered based on the profit from marine transportation between Hokkaido island and Honshu main island. 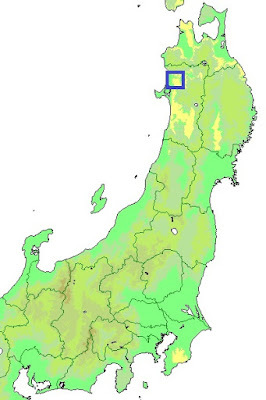 Their main base Tosaminato port at current Aomori prefecture was one of the largest ports in Japan at that era, continues over 2 kilometer along the sandbank between sea and Lake Jusanko. 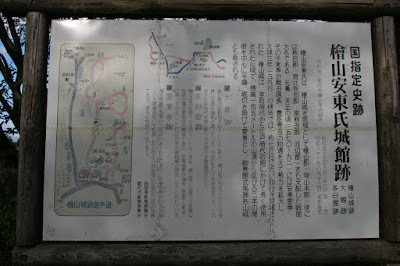 Furthermore, in 14th century, Ando clan seized Tsuchizaki port at current Akita city, another large port at Sea of Japan, and sent branch family there. Ando clan engaged in marine transportation and commerce across the coast of Sea of Japan, and named as "Great general of sunrise area" (at that time, Tohoku region was recognized as the eastern border of Japan seen from Kyoto city). 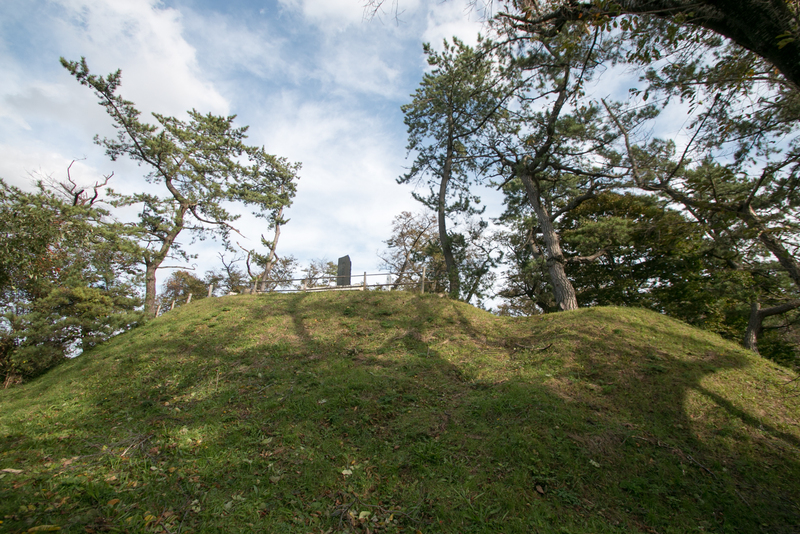 Muromachi Shogunate approved their authority and treated them as a magistrate in north edge of Tohoku region and Hokkaido island. 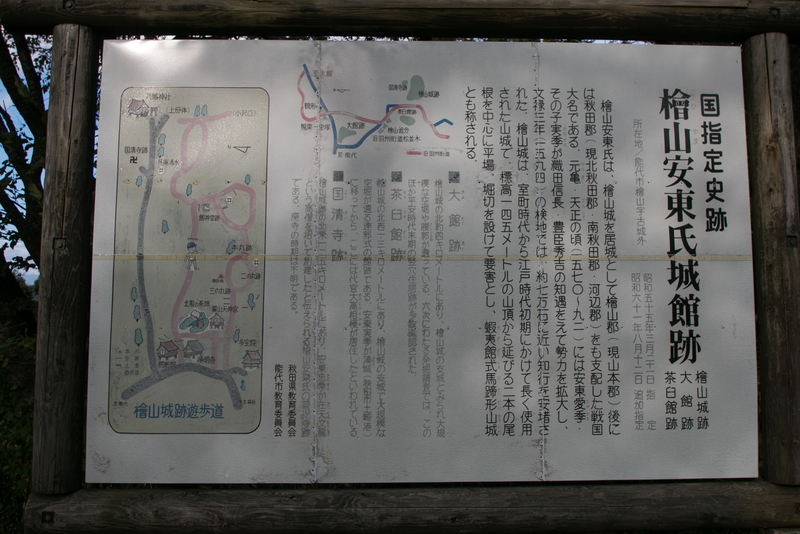 But in 15th century, Nanbu clan which governed Pacific Ocean side of current Aomori prefecture rapidly grew and started expansion toward west. 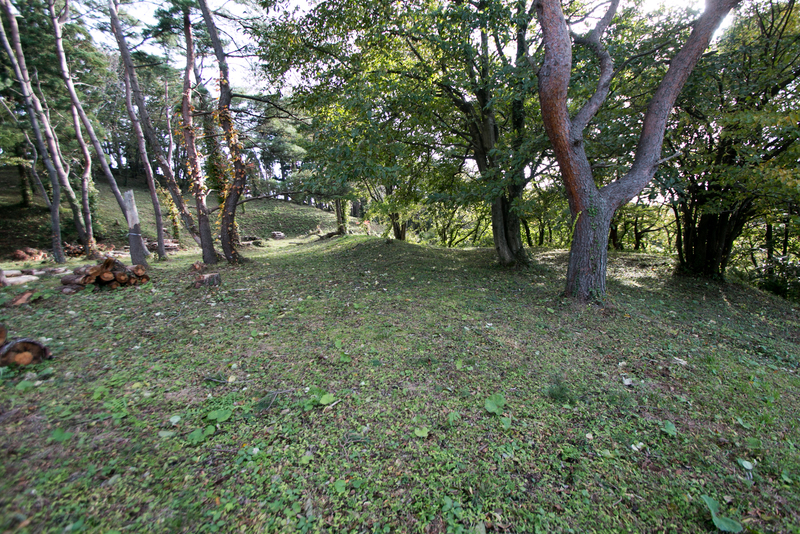 In the middle of 15th century, main family of Ando clan left Tosaminato port before the attack of Nanbu clan, and retreated into Hokkaido island. Ando clan continuously tried to recover their territory but failed each time. On the other hand, their branch family called as Minato Ando clan steadily continued and prospered at Tsuchizaki port. In the middle of 15th century, Minato Ando clan invited main family of Ando clan from Hokkaido island, then Masasue Ando (?-1488), leader of main family, landed into Dewa province (Akita prefecture) and occupied Noshiro area. Masasue reformed Hiyama castle into a large one and used it as a main base, thus this family became to be called as Hiyama Ando clan. 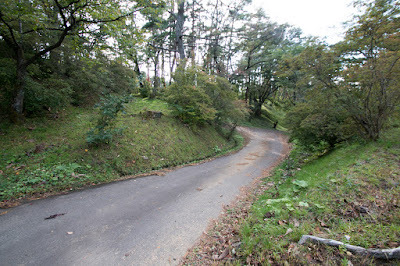 Masasue ruined Kasai clan which originally held Noshiro area, and totally renovated Hiyama castle as his residence by the time of his son Tadasue. 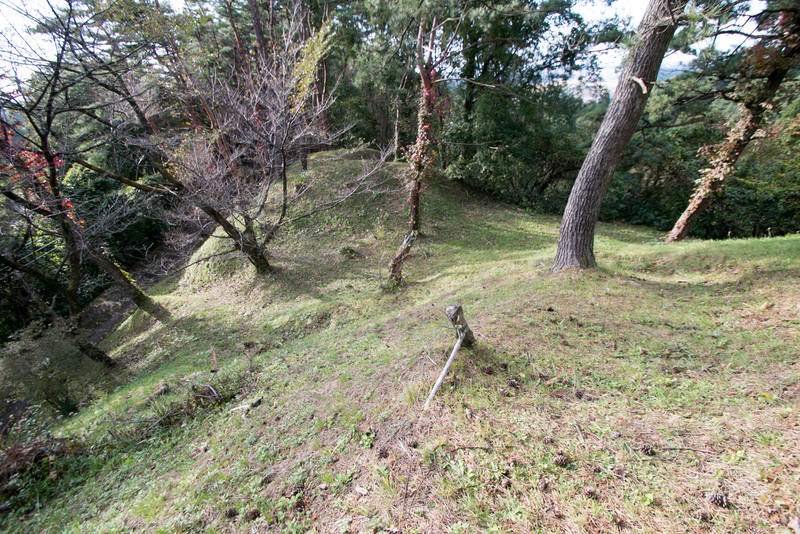 Kiriyama mountain is located next to Hiyamagawa river, a tributary of Yoneshirogawa river, and deeply hollowed by valleys. 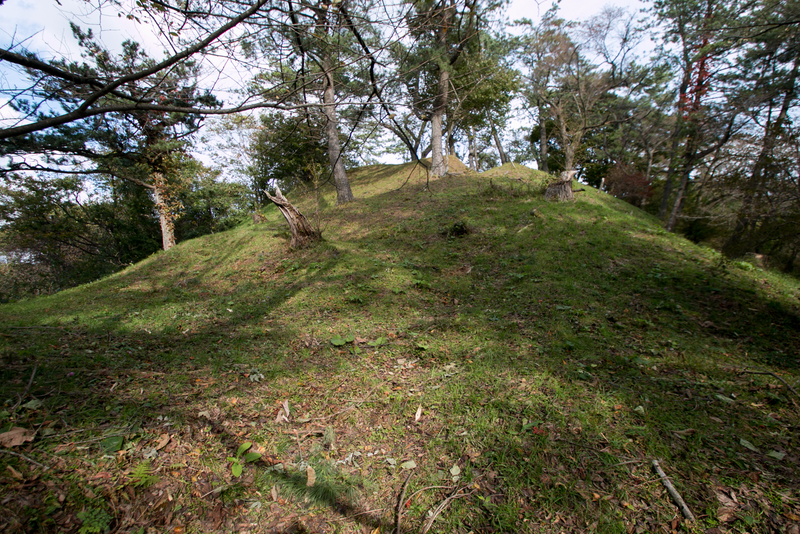 Rough shape of the mountain is T letter 90 degree rotated to right angle, and Hiyama castle spreads along with the ridge of mountain. 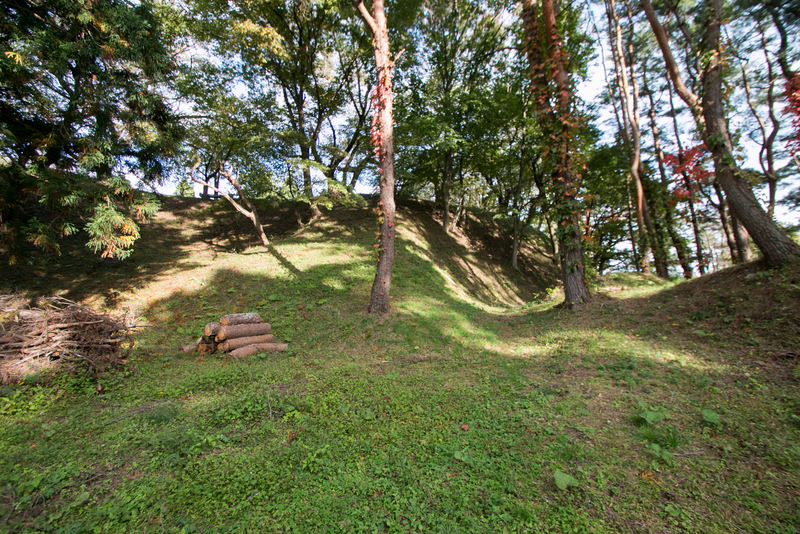 Central area of the castle is a round shaped area of 50 meter diameter at the middle of vertical bar of T letter. 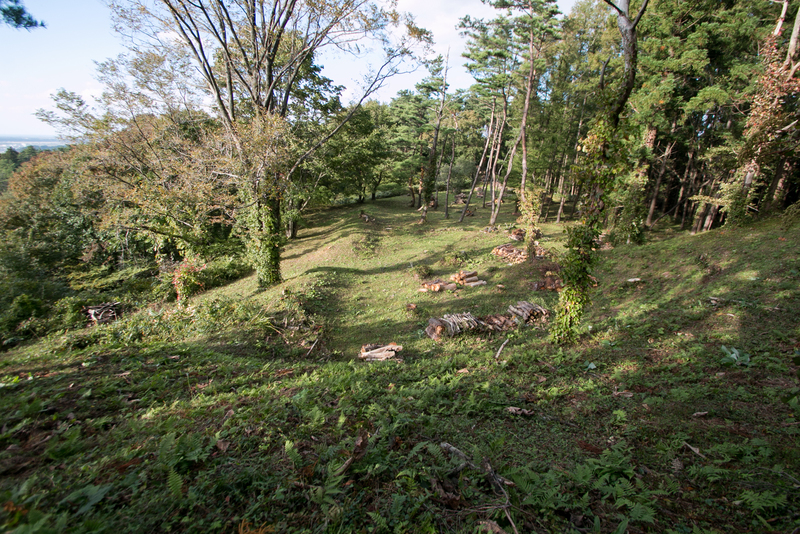 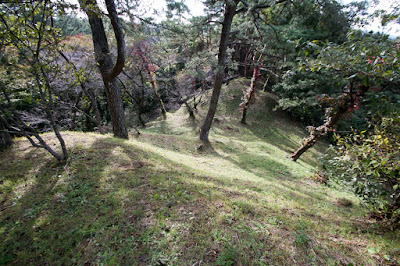 Along with the main ridge of the mountain spread toward west, secondary area and third area are built in line. 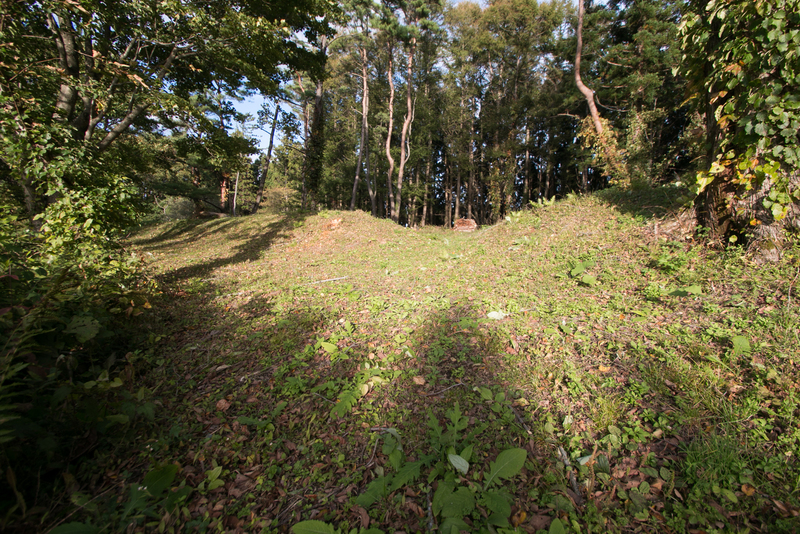 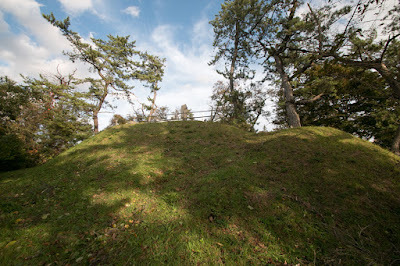 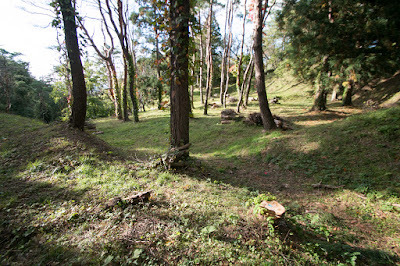 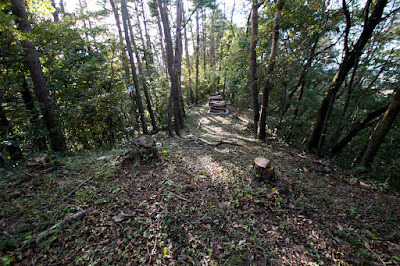 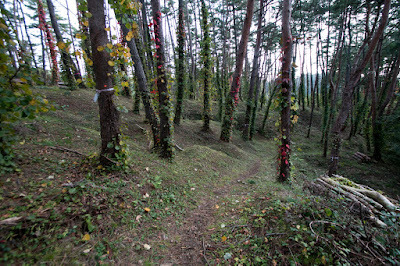 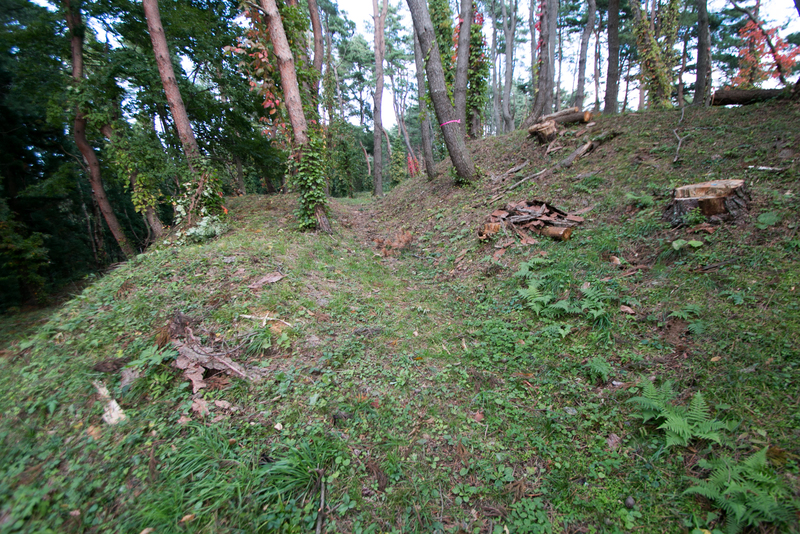 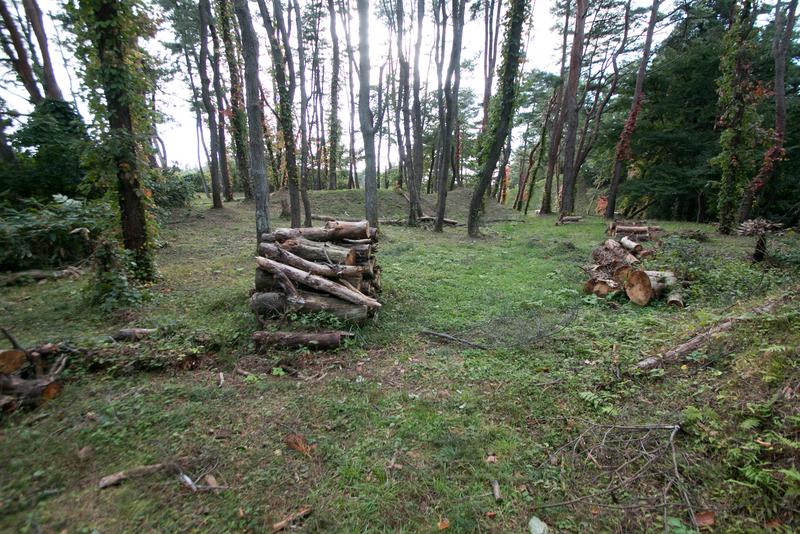 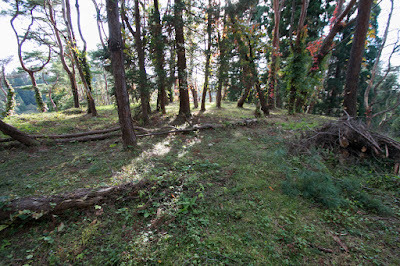 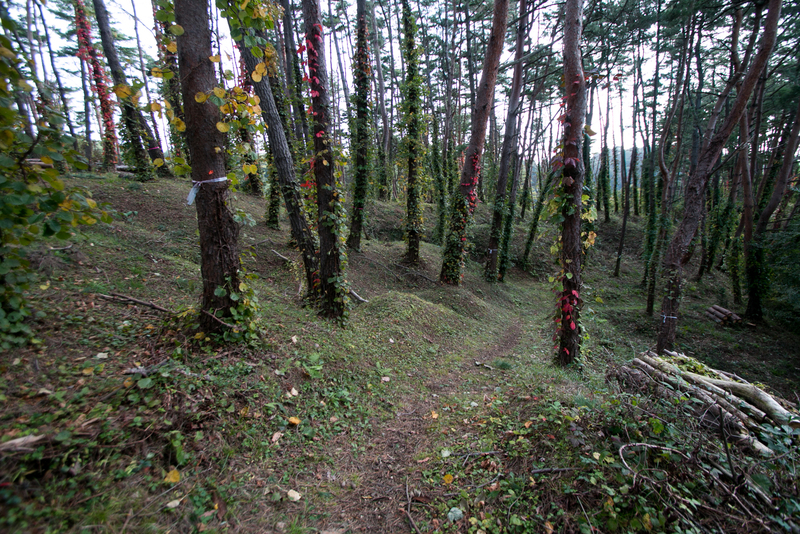 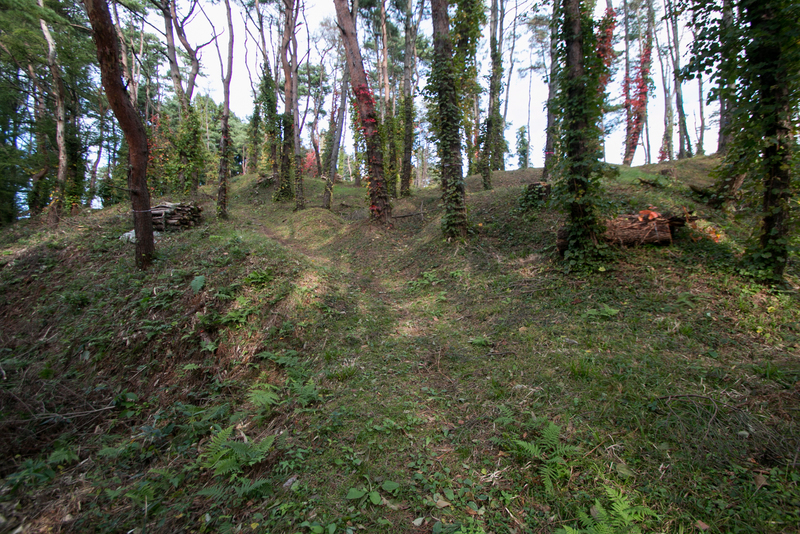 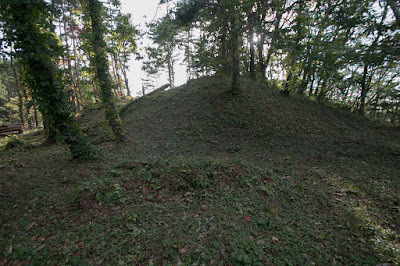 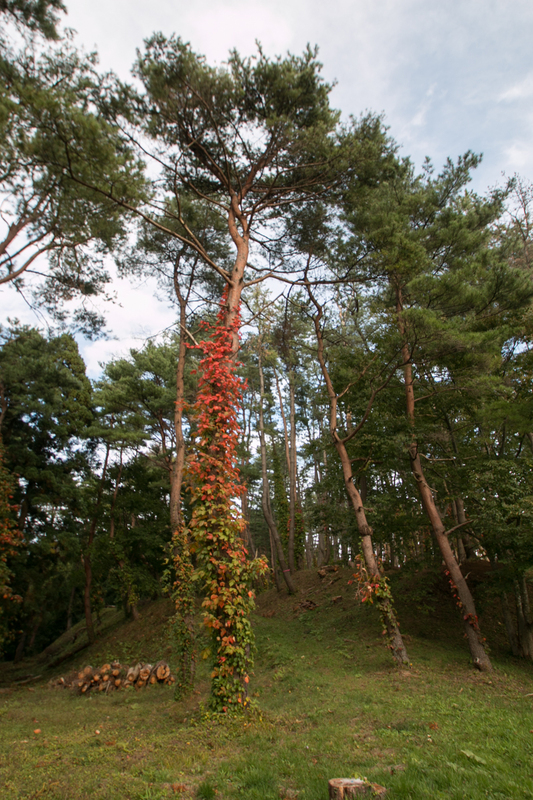 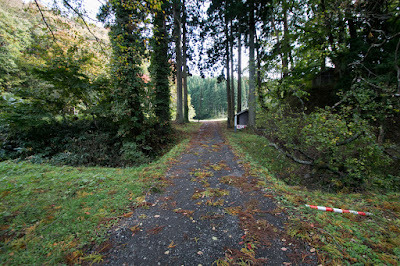 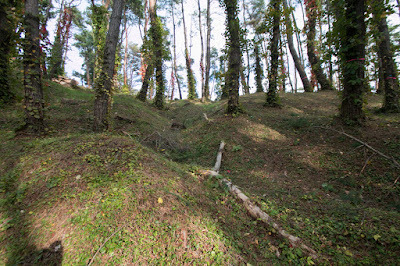 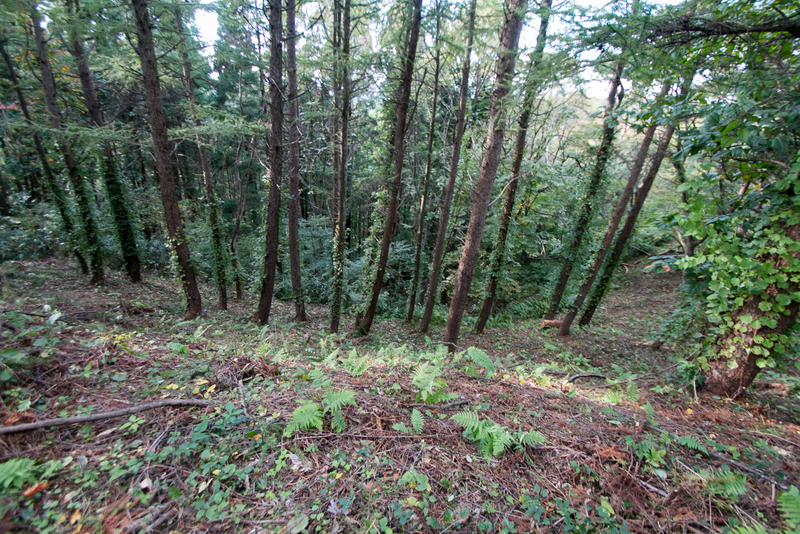 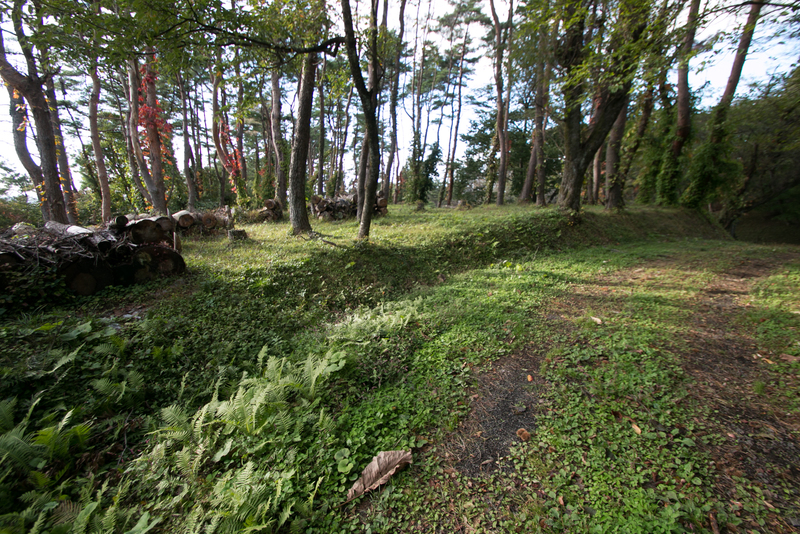 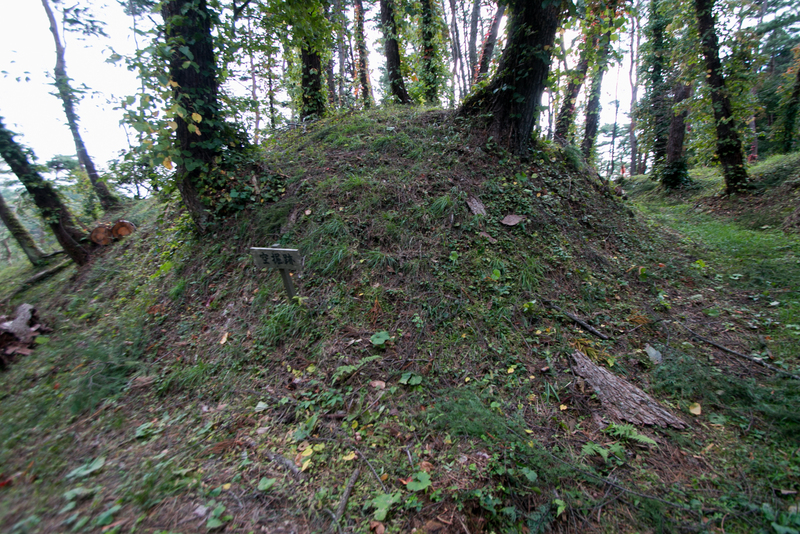 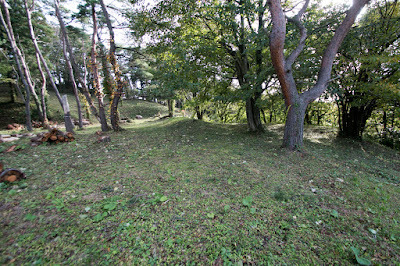 Third area is a large area of 100 meter long and 20 meter wide, and at the edge there is a basement of corner turret guarded climbing road to the castle. 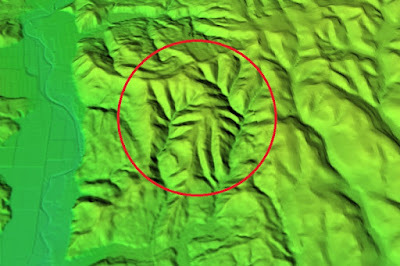 From central area many small ridges spreads in all directions like an octopus, and many terraces are built by digging these small ridges. At the backside of central area, there is a saddle point to horizontal bar of T letter, and there is a composite gate preparing the attack from backside. 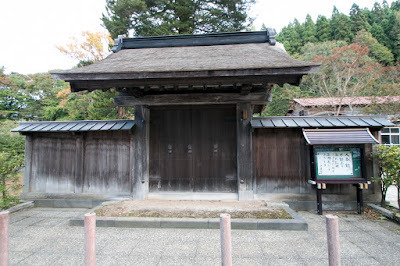 Ahead of this gate, there is another peak called as "Shogunyama" at the connecting point of vertical bar and horizontal bar. 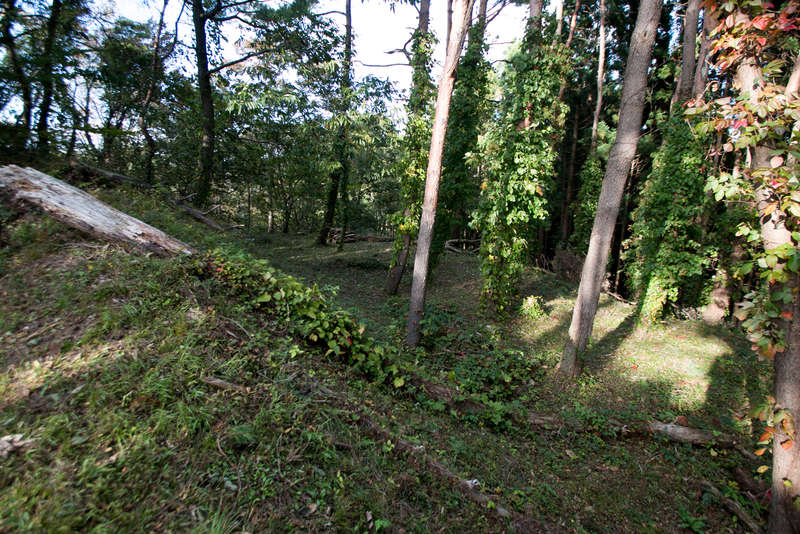 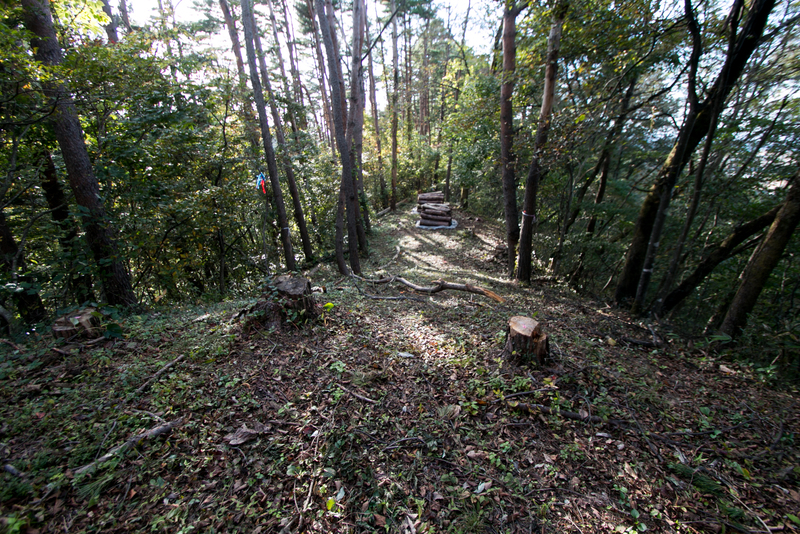 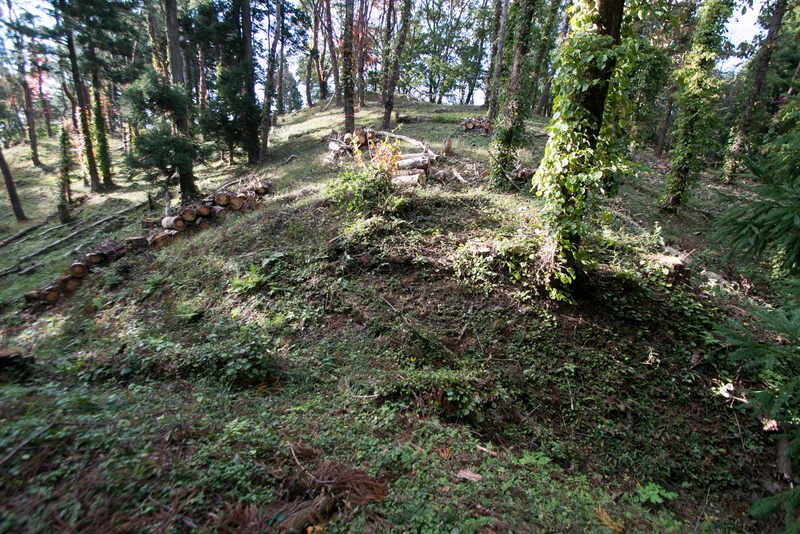 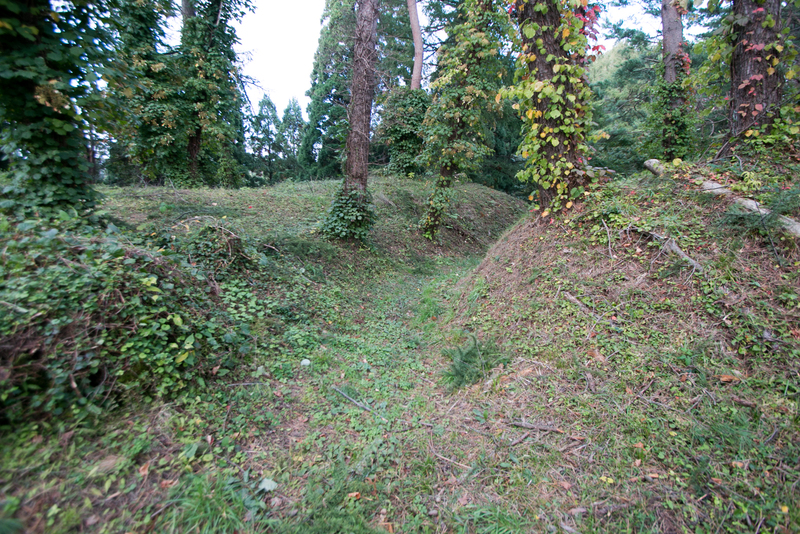 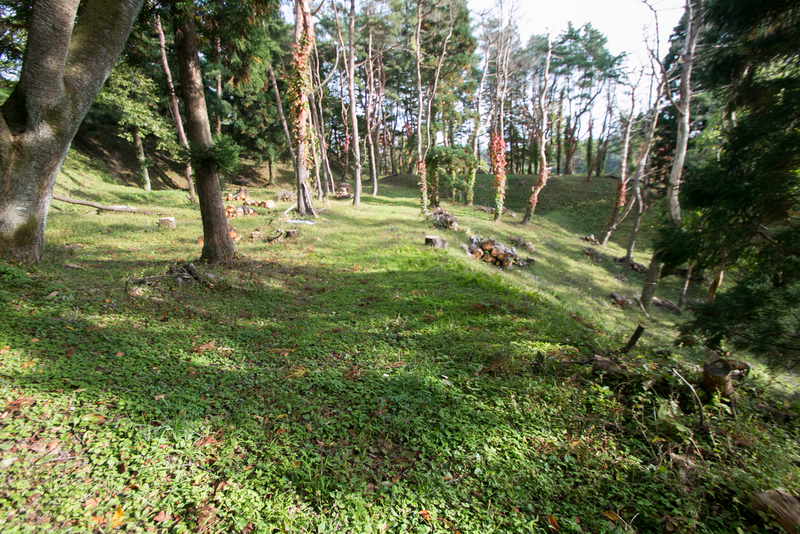 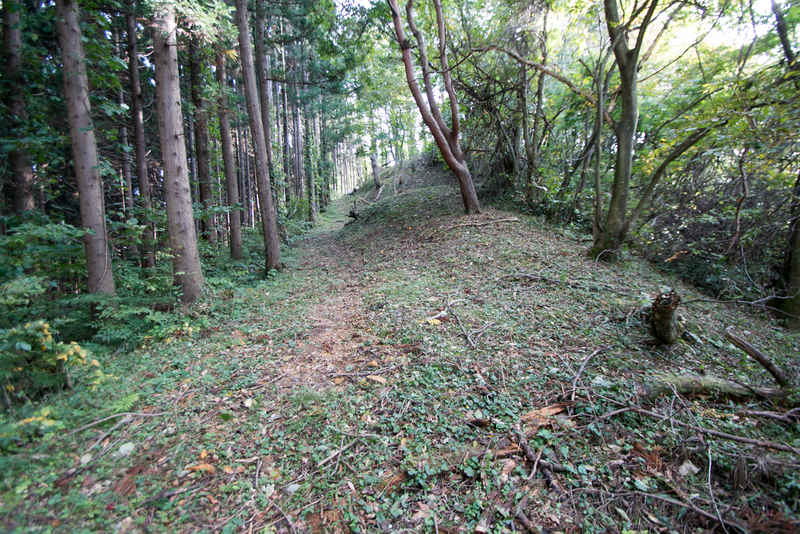 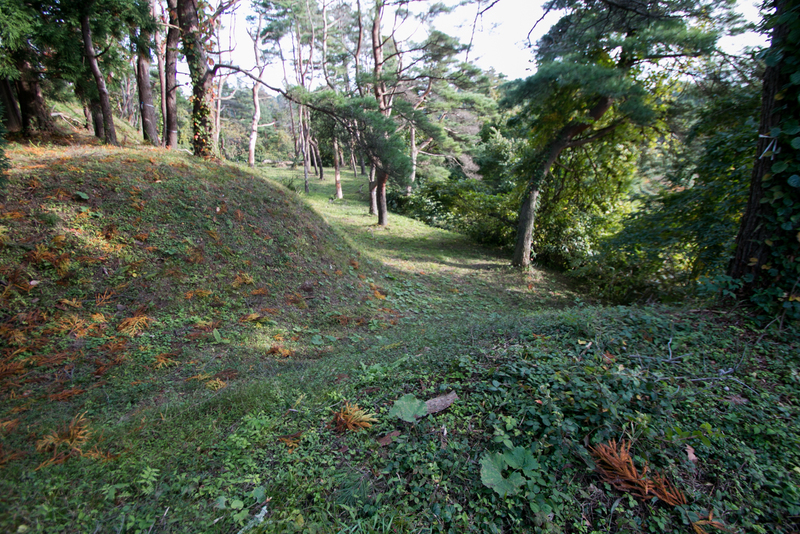 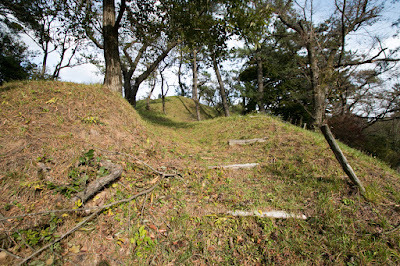 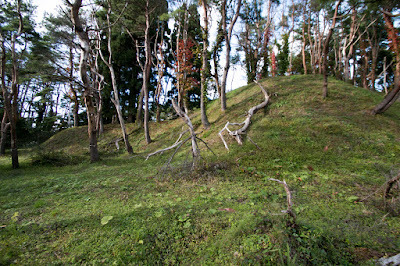 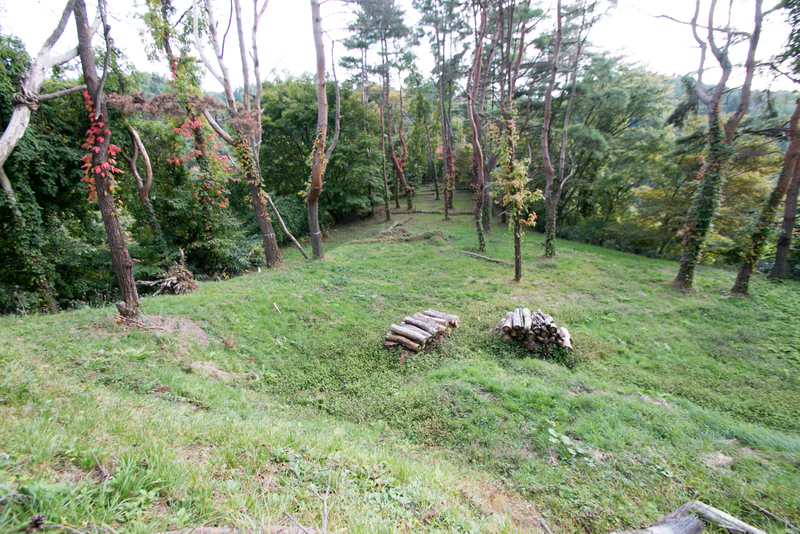 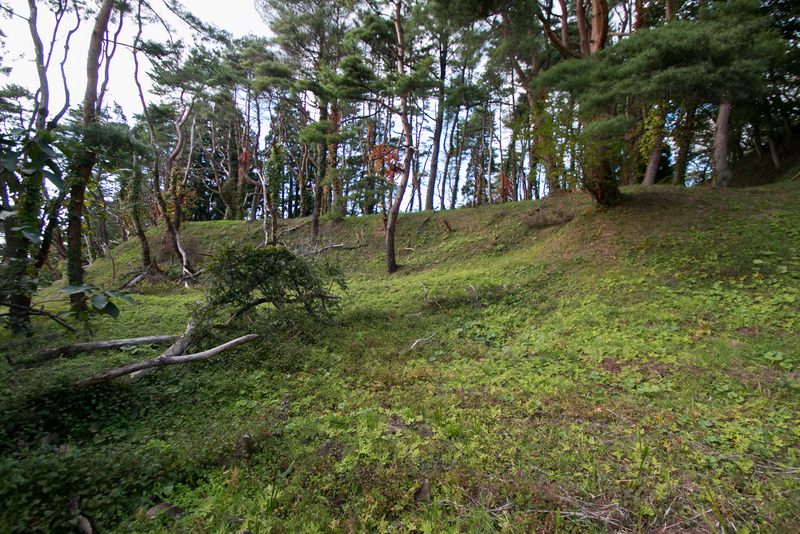 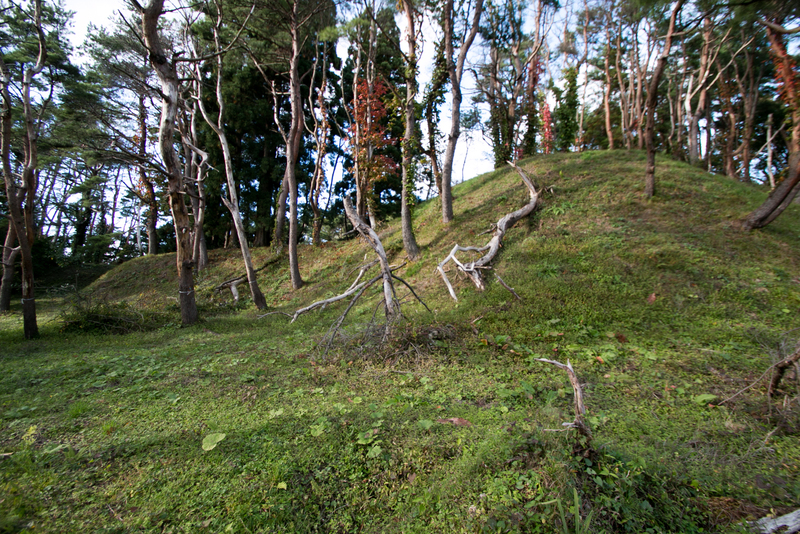 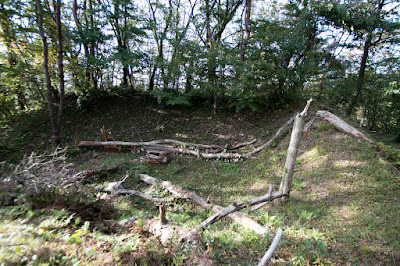 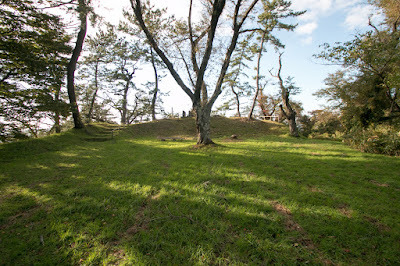 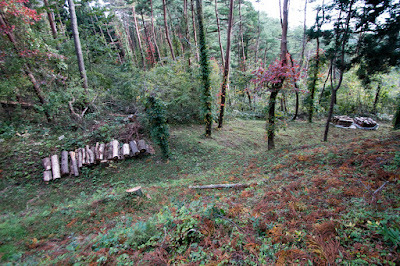 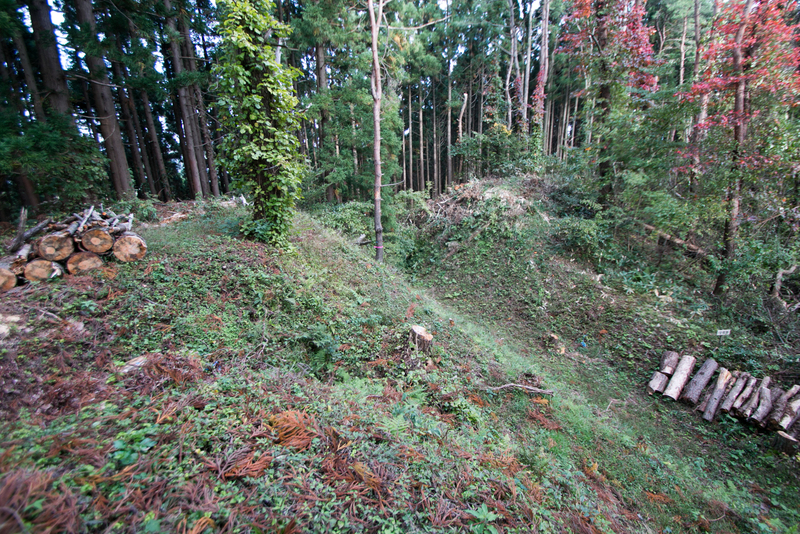 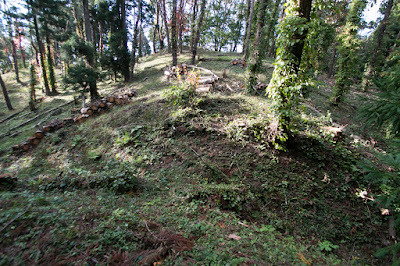 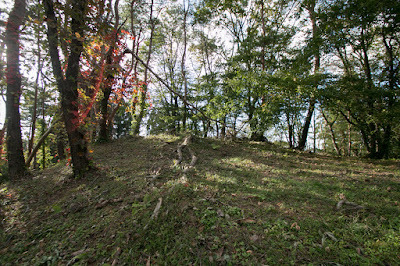 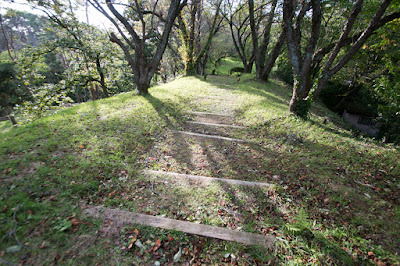 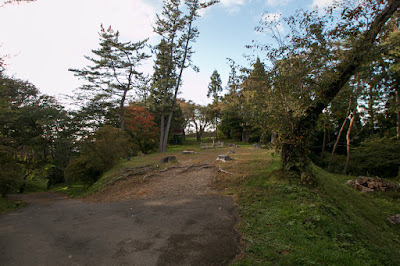 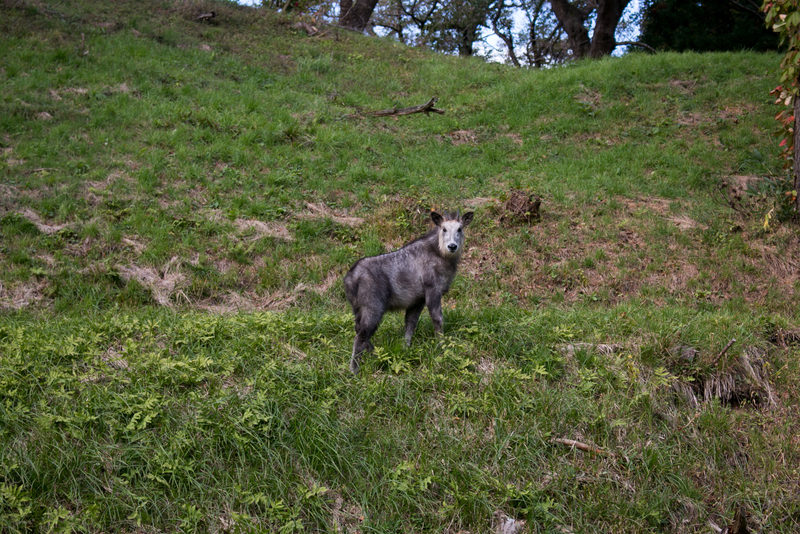 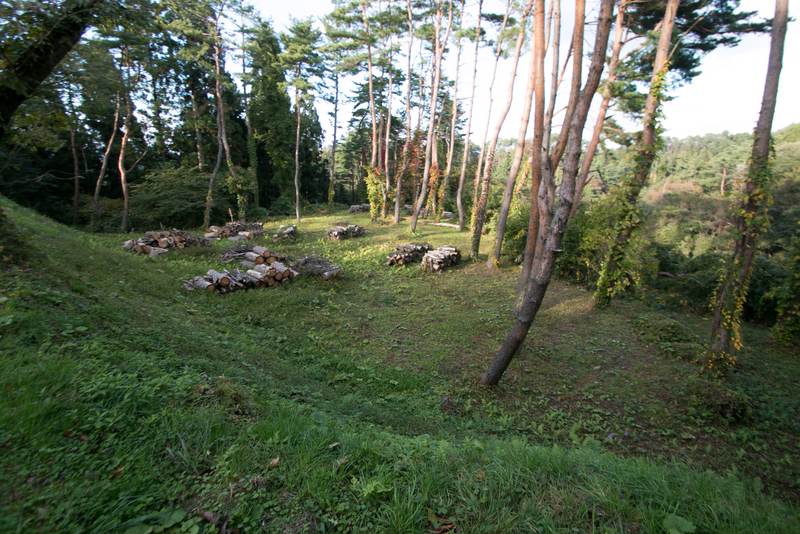 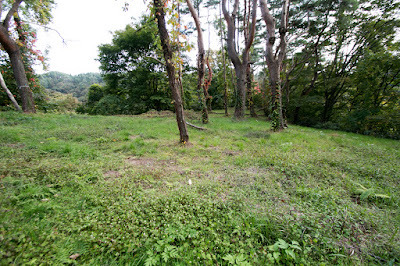 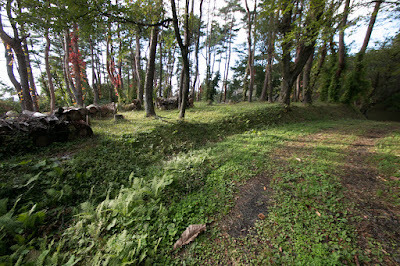 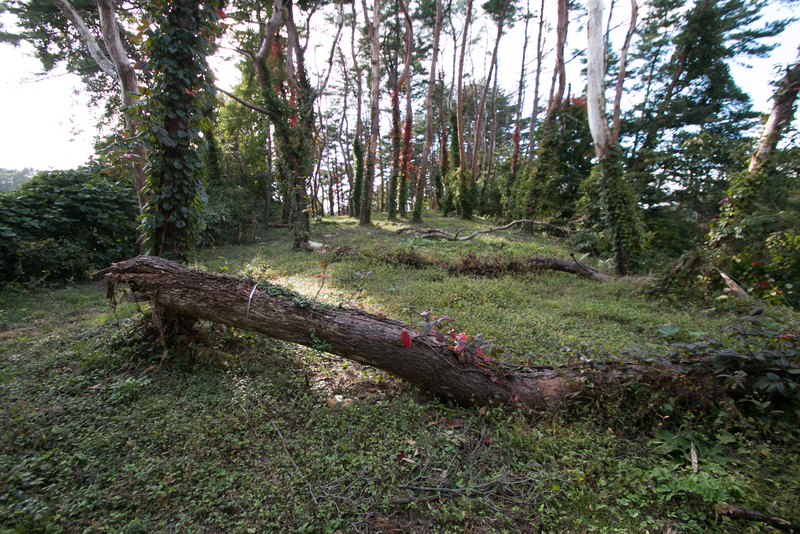 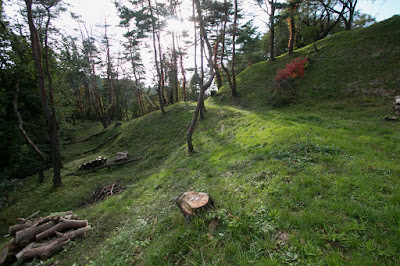 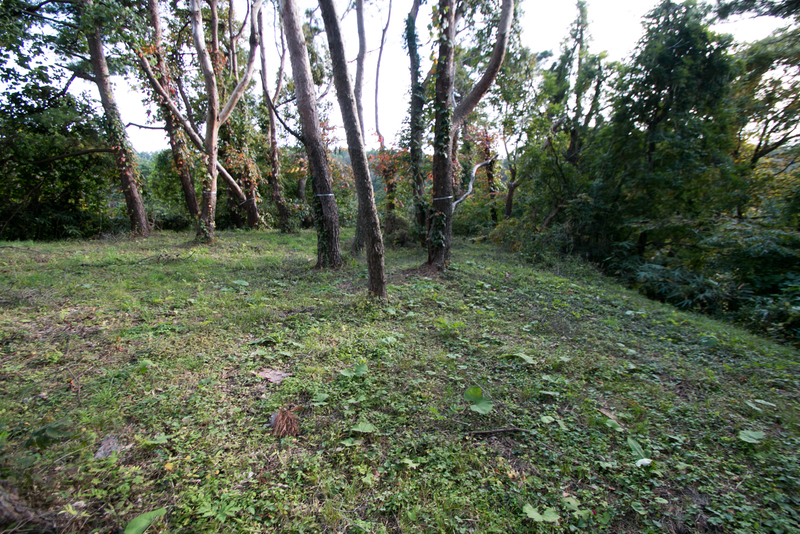 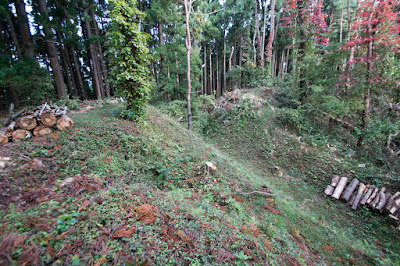 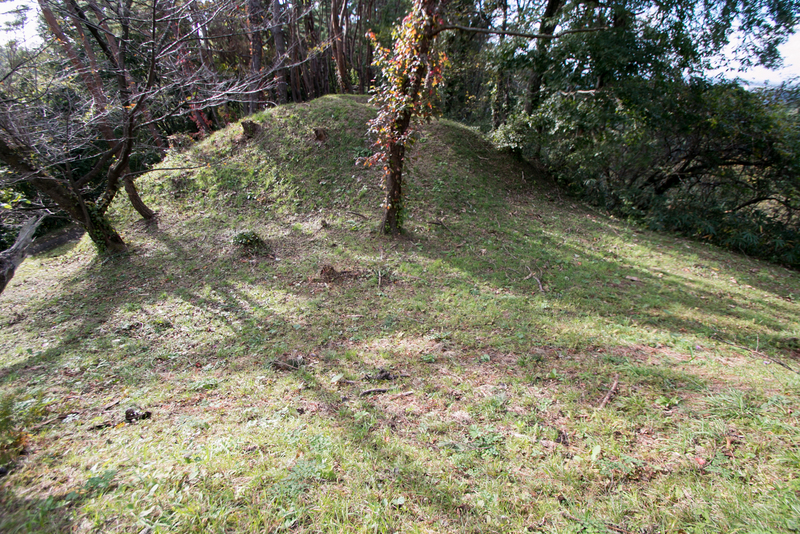 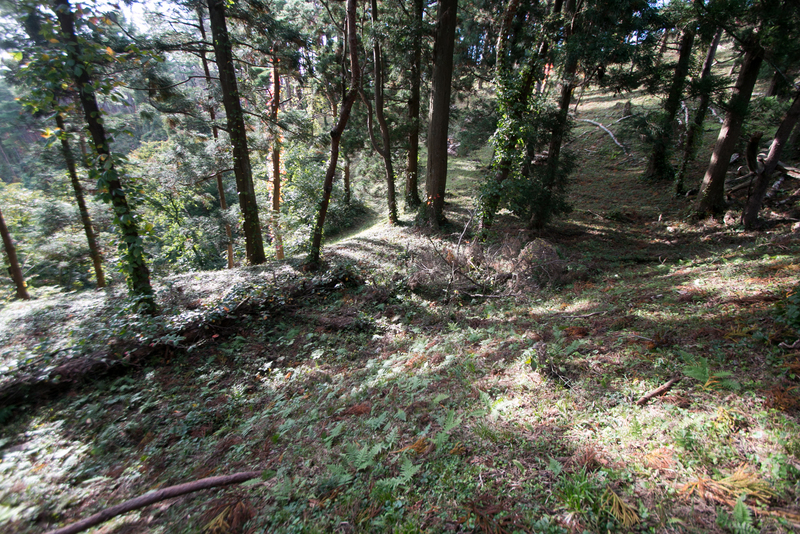 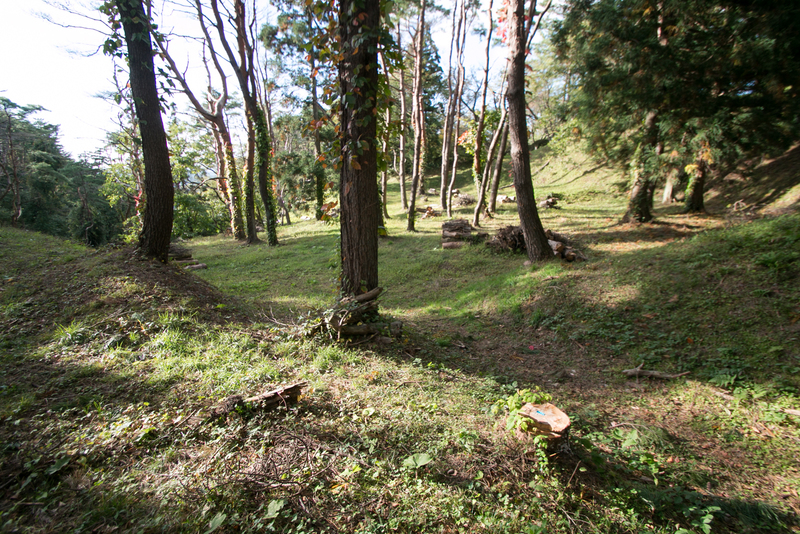 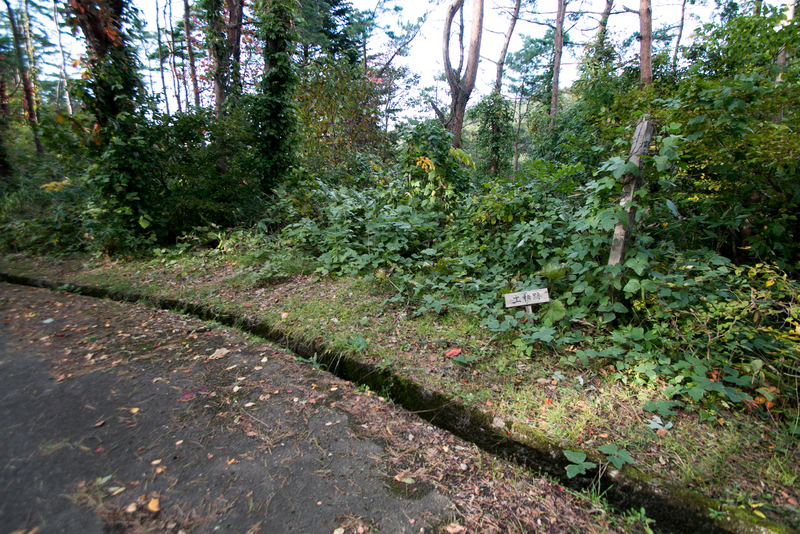 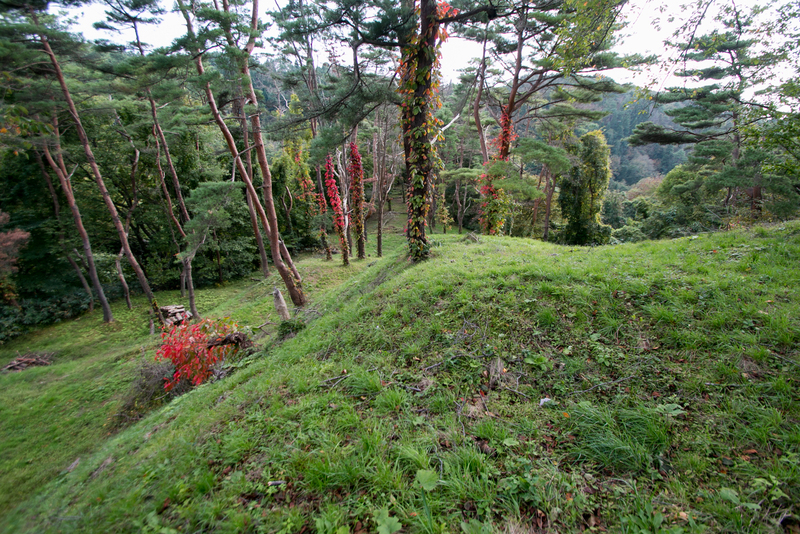 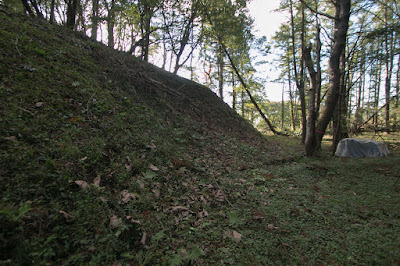 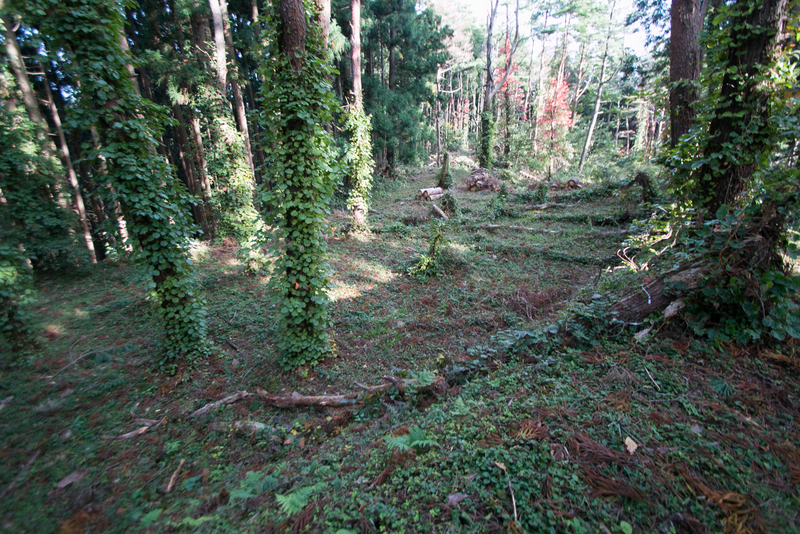 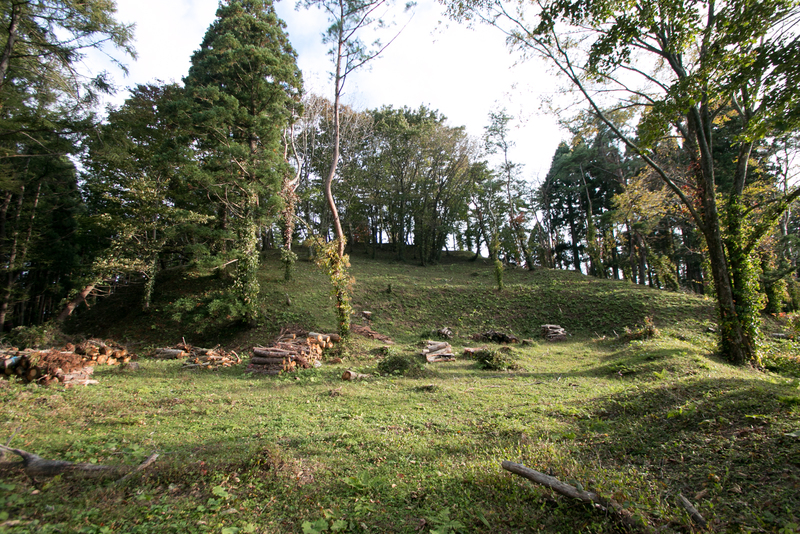 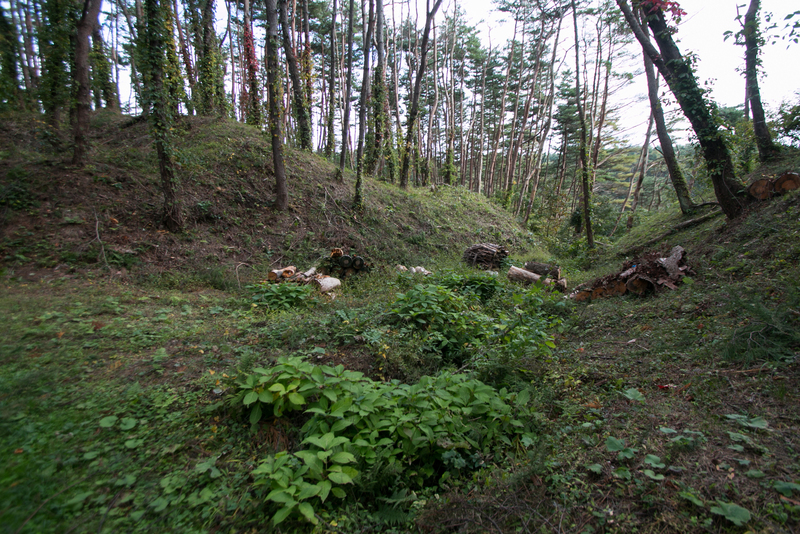 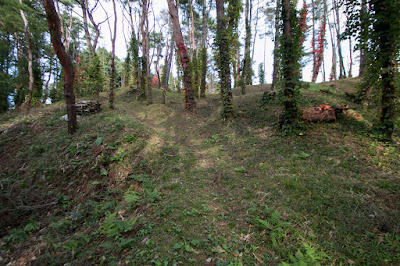 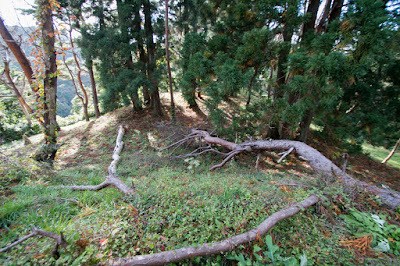 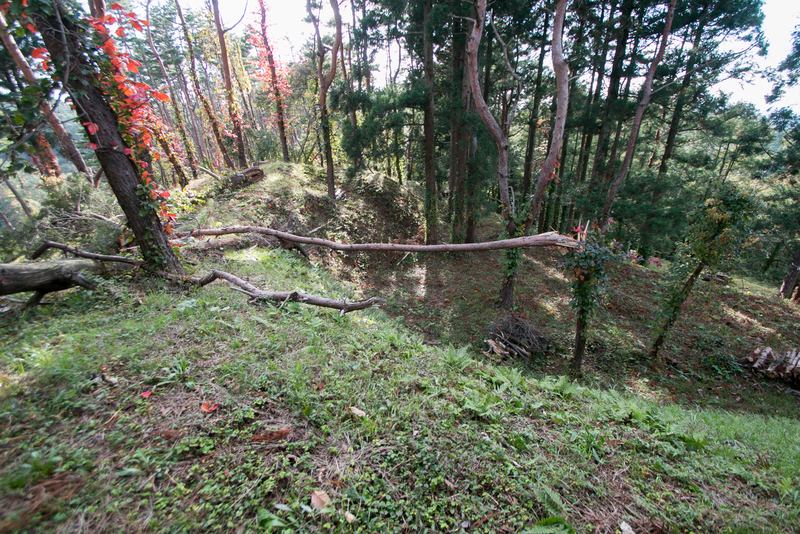 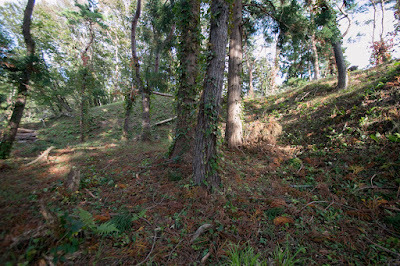 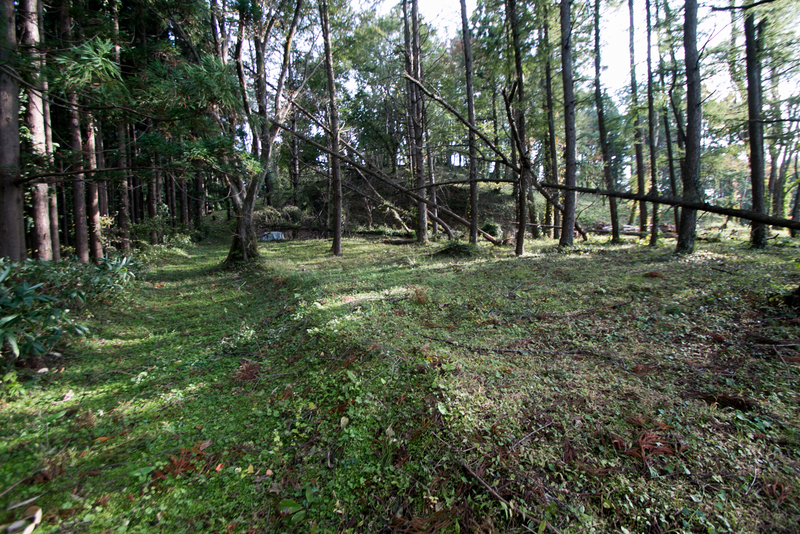 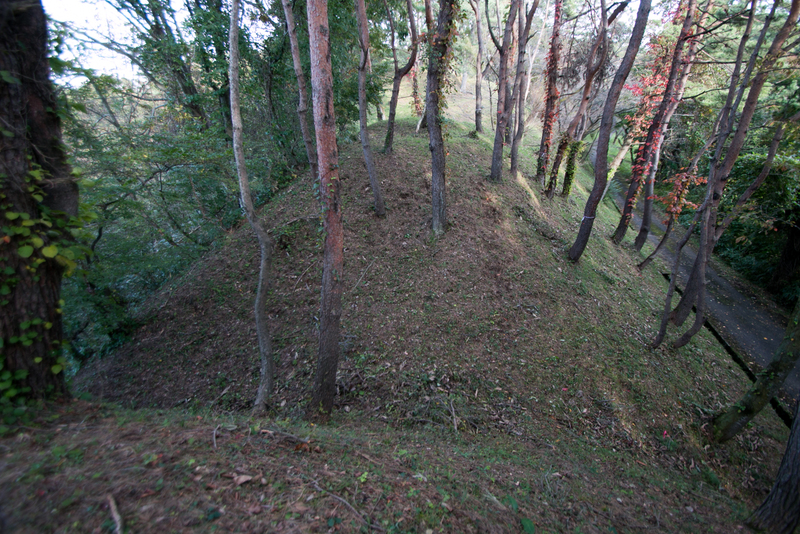 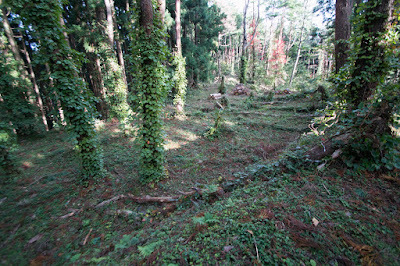 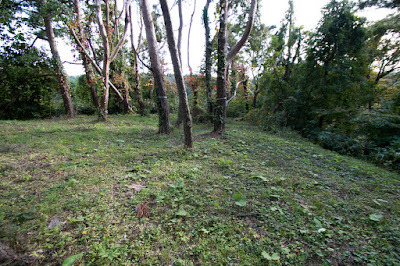 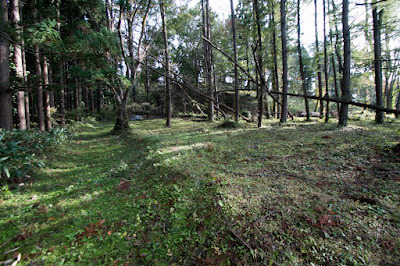 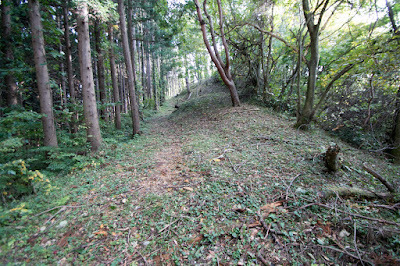 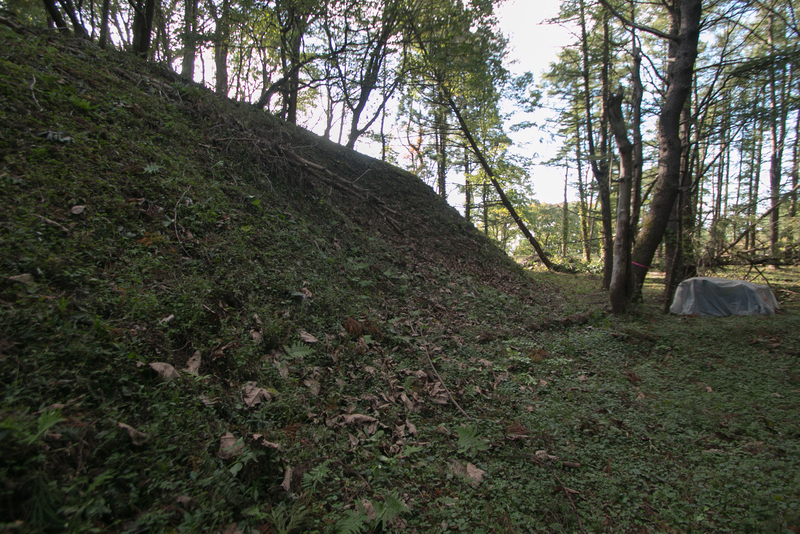 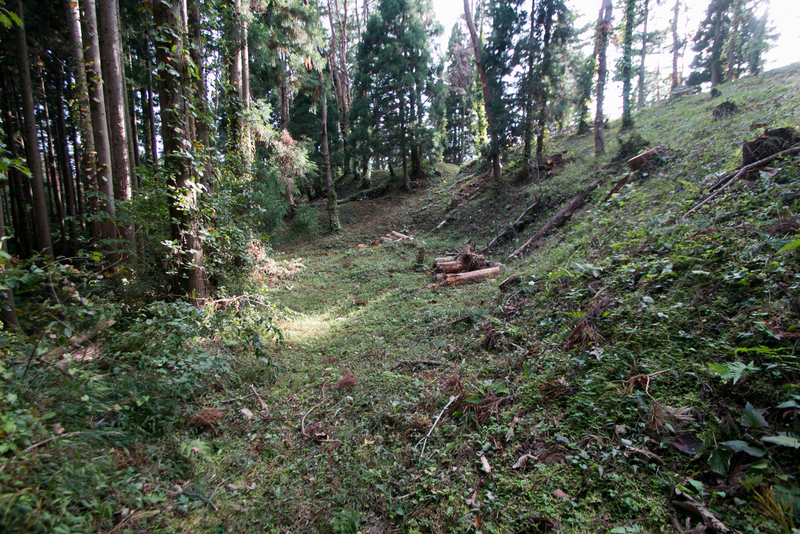 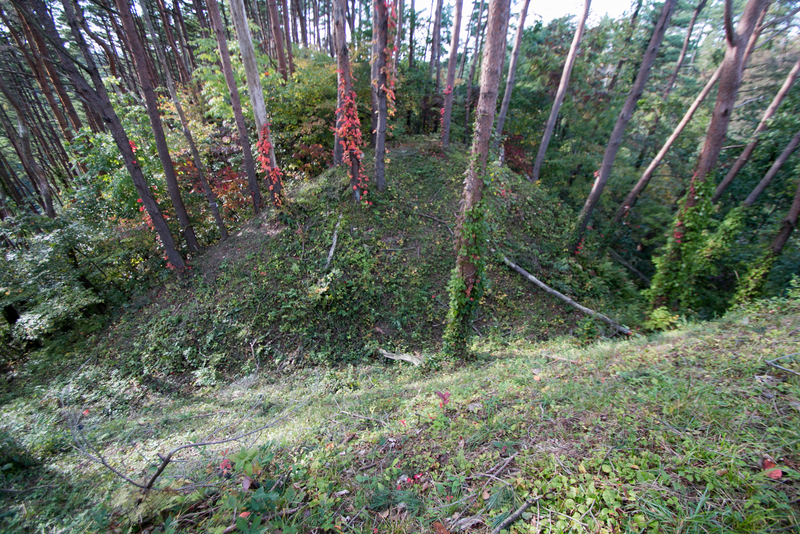 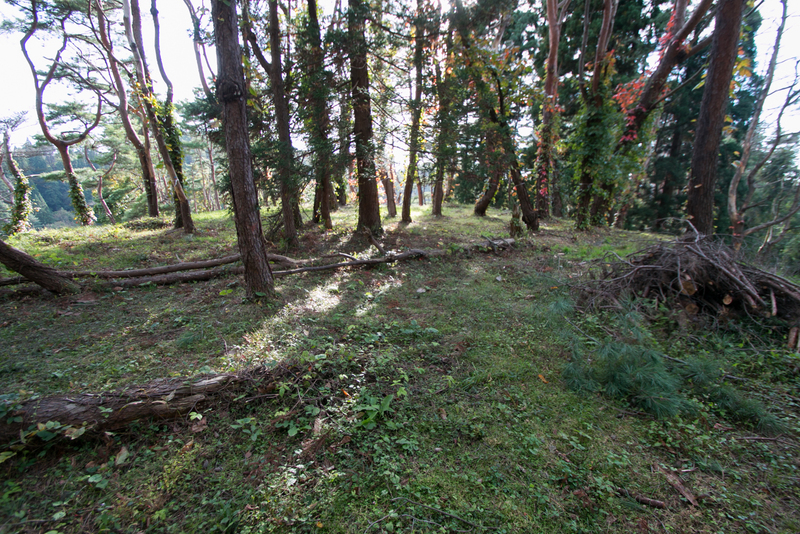 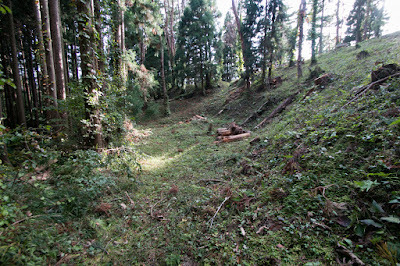 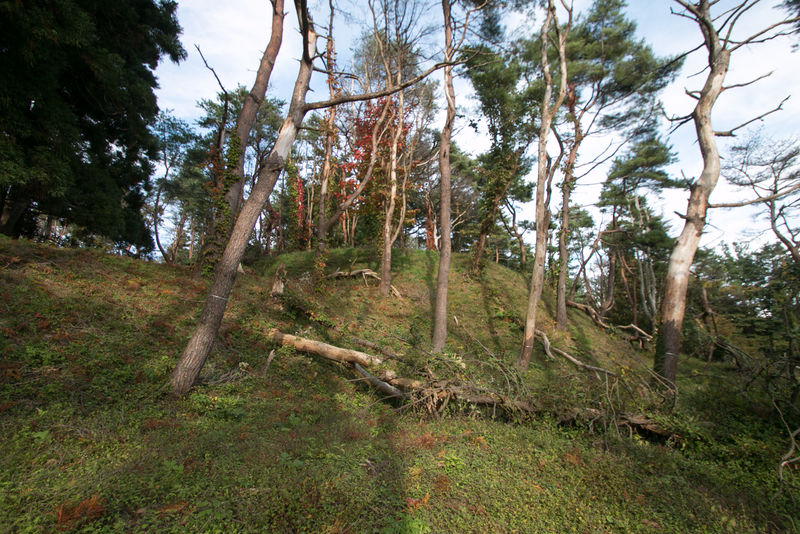 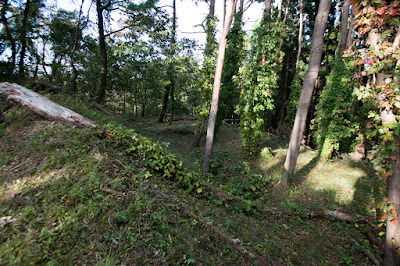 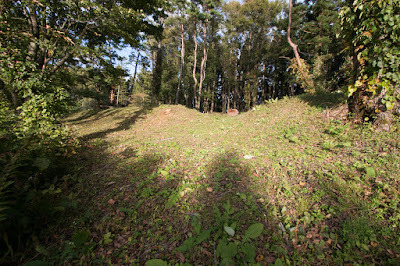 A gentle slope in front of Shogunyama mountain is cut by many small dry moats, to obstruct the maneuver of the enemy. The right side of horizontal bar is separated by deep dry moat from next part. 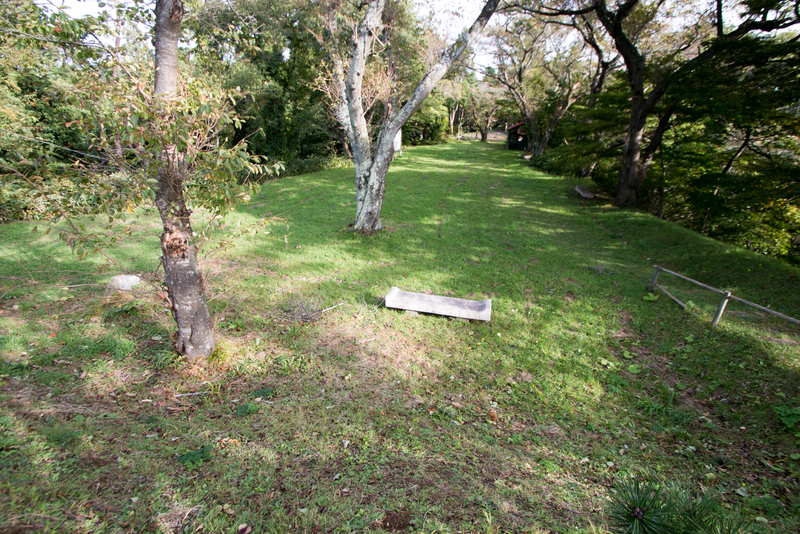 On the other hand, the left side of horizontal bar is a considerably flat area and used as a residence of the lord. 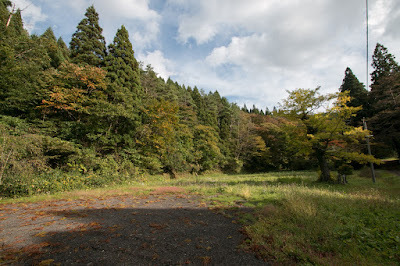 At the edge of this side there is a depression surrounded by clay wall called as "Yakatagami", and there might be a ritual shrine of Ando clan. 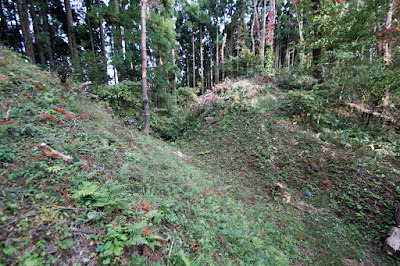 This side is also separated by deep dry moat from outside, and ahead of this dry moat there is another line of terraces continues parallel with main ridge of the mountain. 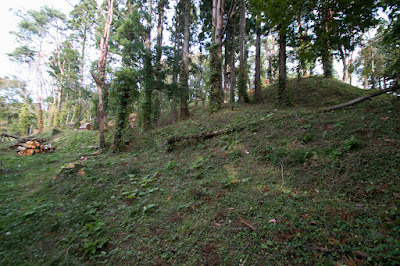 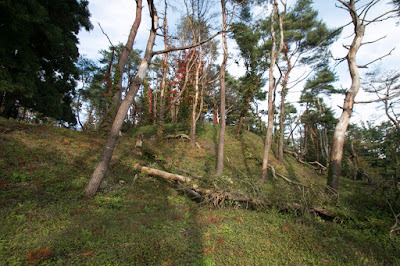 Outside of these main areas, many terraces are built along with the slope. Total size of the castle is about 1,000 meter and 500 meter, and one of the largest mountain castle in eastern Japan. 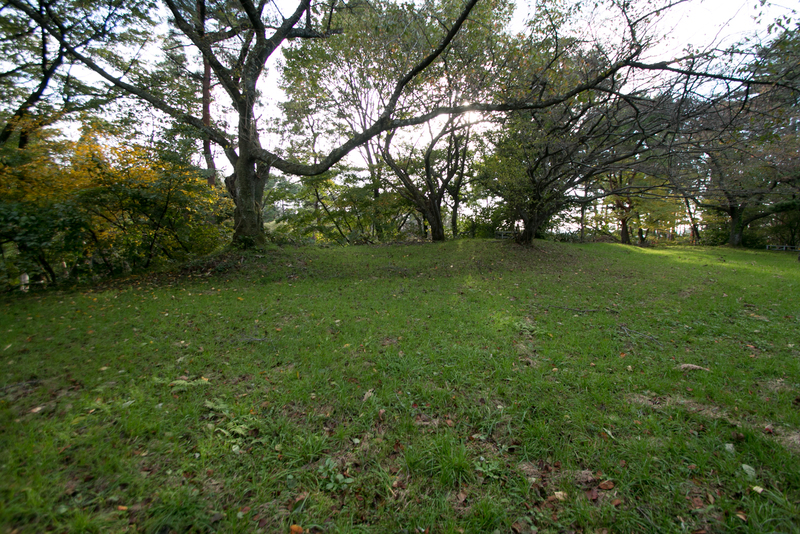 Style of Hiyama castle consists of many small flat areas made by digging ridges and dry moats is an old one, but this castle has a clear plan to separate the core part from outside and might be made at one time under clear planning. 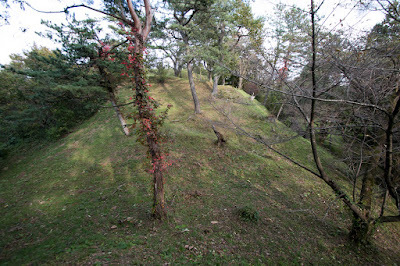 Hiyama castle located as inside of the valley, and caste town was built along the valley. 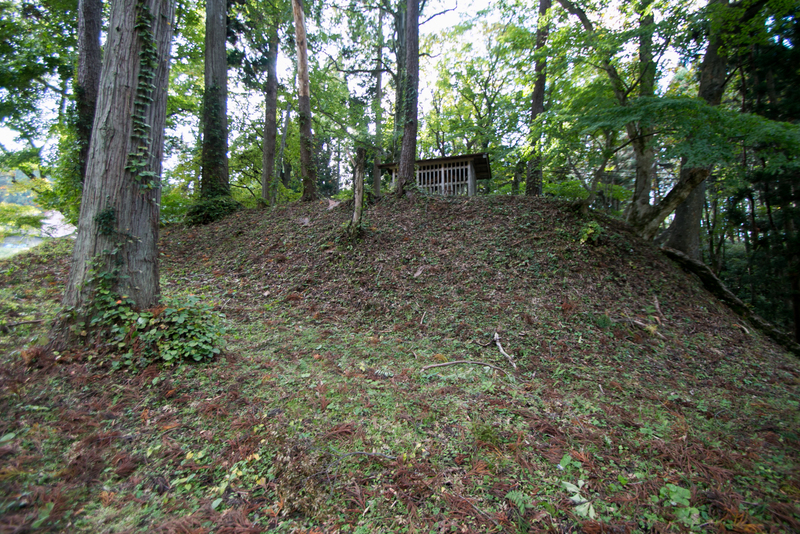 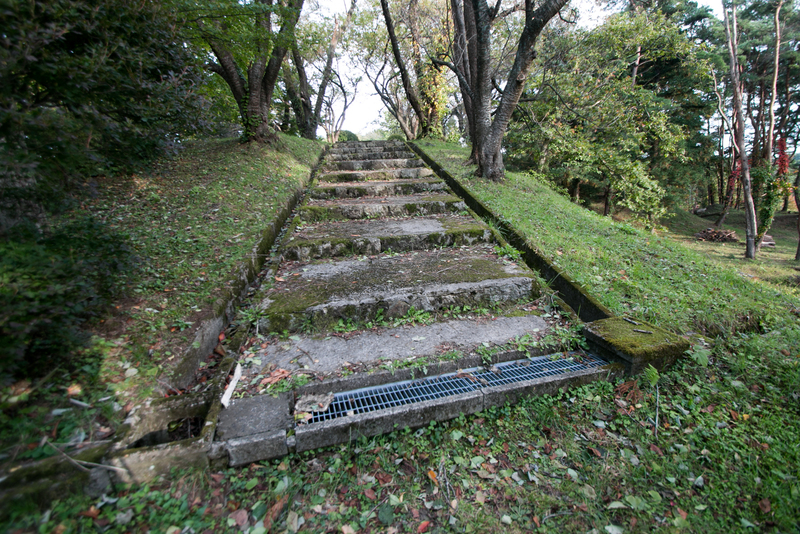 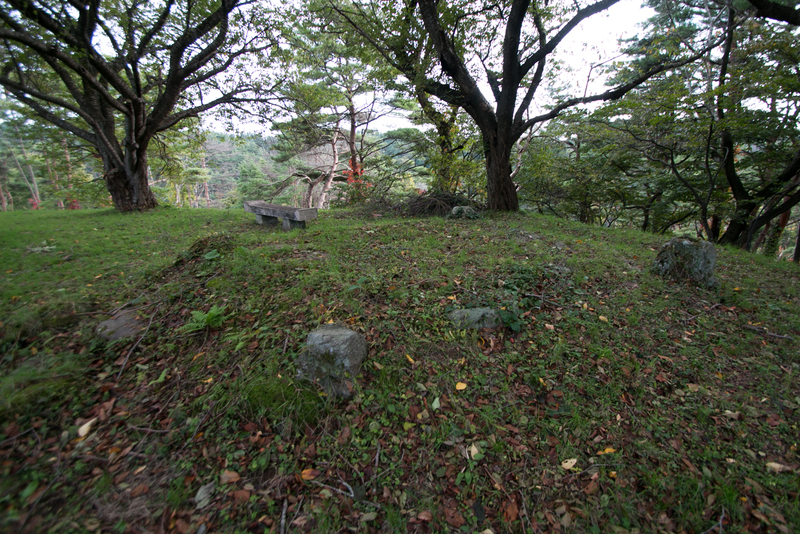 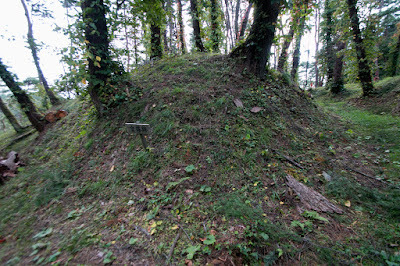 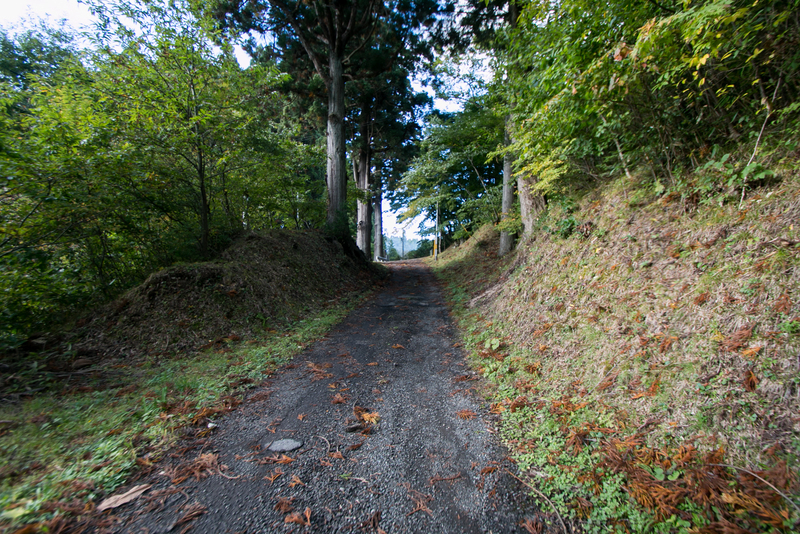 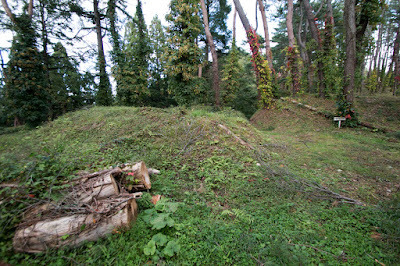 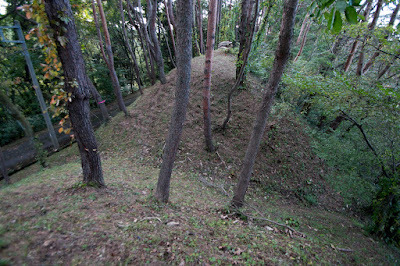 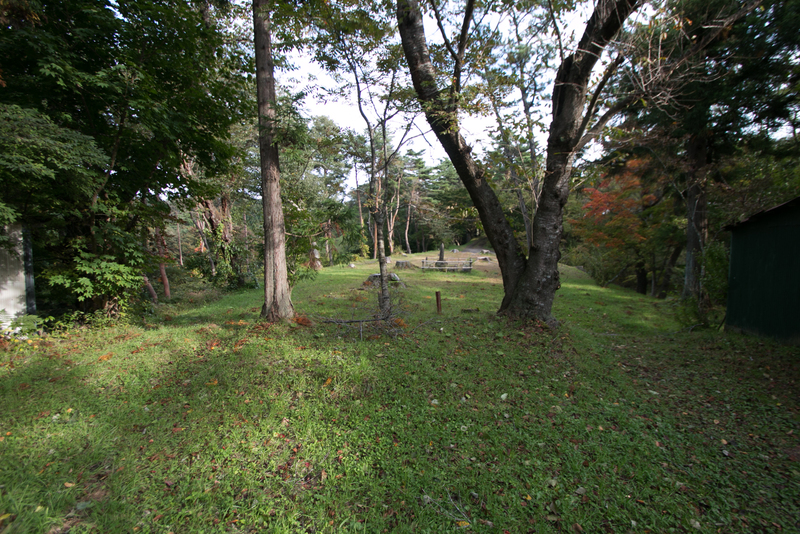 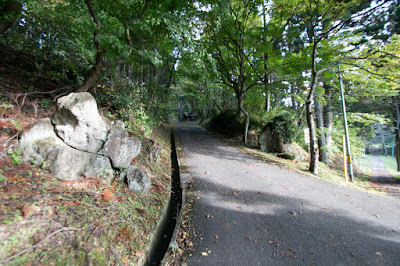 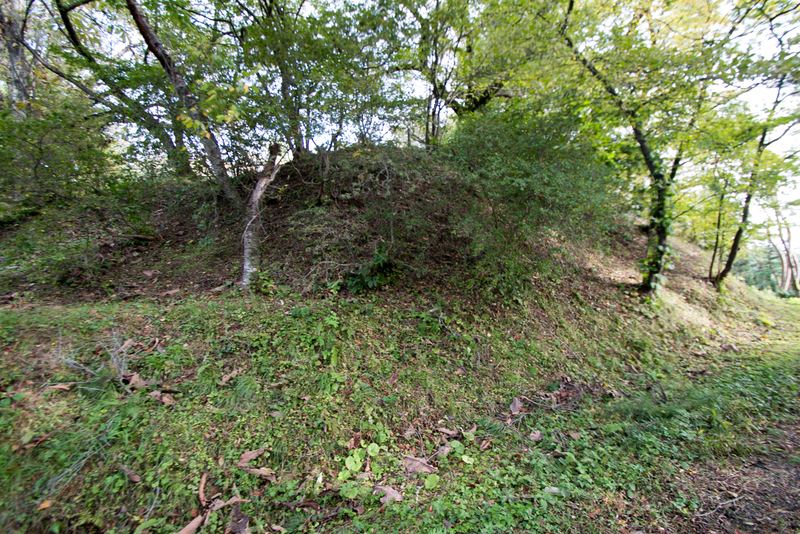 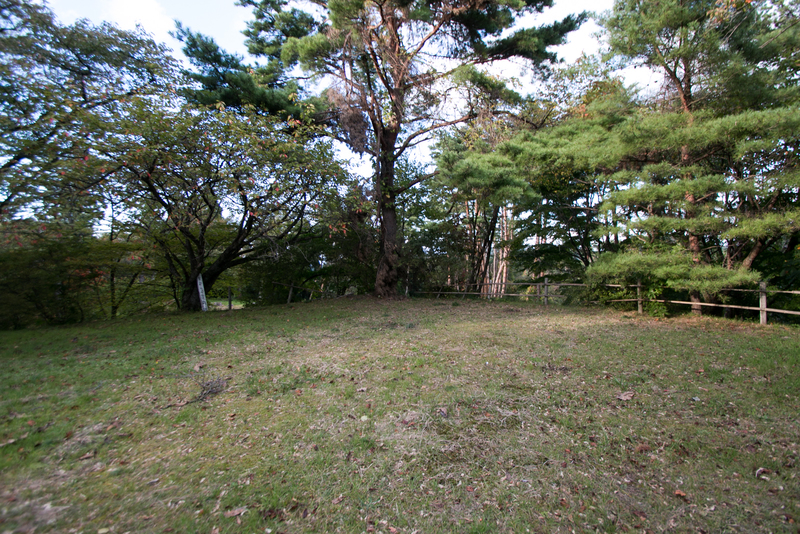 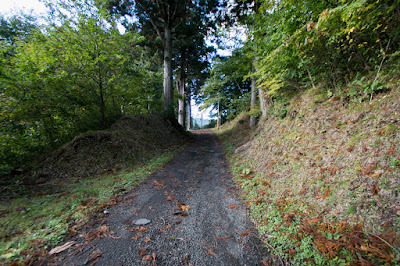 Outside of the valley, front forts such as Odate and Chausudate are built, to guard the attack from Ugokaido road. 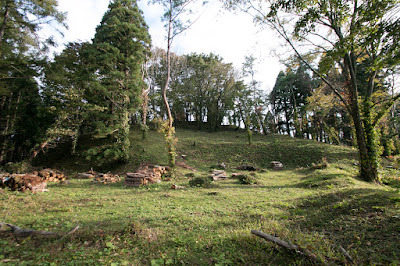 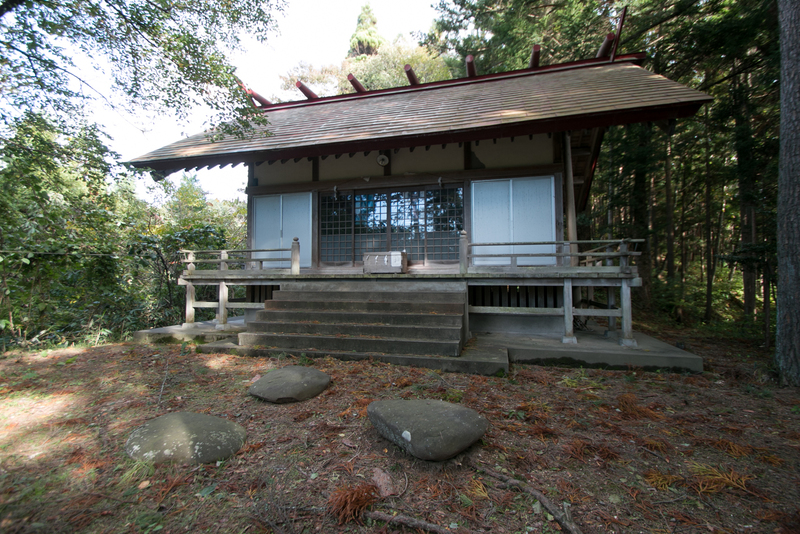 Many temples built by Ando clan still exist near the castle, and these temples tells former prosperity of Hiyama castle and castle town until now. 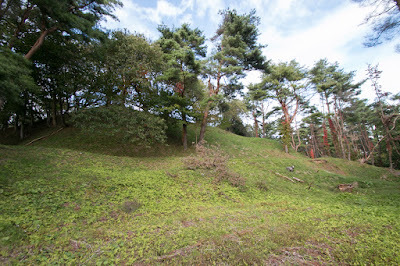 It is wonder why Hiyama Ando clan which was defeated by Nanbu clan and just landed to Dewa province could build such a large castle, but even though lost their original territory they still had the wealth and trade interest from marine transportation. Hiyama Ando clan stabilized their foundation significantly grew at their brilliant leader Chikasue Ando (1539-1587) praised as a Big Dipper. 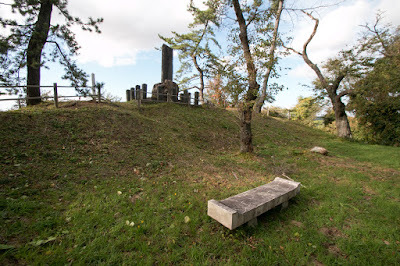 Utilizing the absence of successor of Minato Ando clan, Chikasue united two Ando clans and expanded his territory in a struggle with surrounding strong warlords such as Nanbu clan, Daihoji clan or Onodera clan. 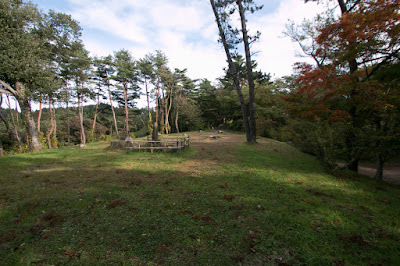 Chikasue strengthened control on the commerce at Akita and Noshiro port, and communicated with central rulers such as Nobunaga Oda (1534-1582) or Hideyoshi Toyotomi (1537-1598). Chikasue changed his surname to Akita clan, and built his new residence Wakimoto castle (Akita prefecture) at the root of Oga peninsula. 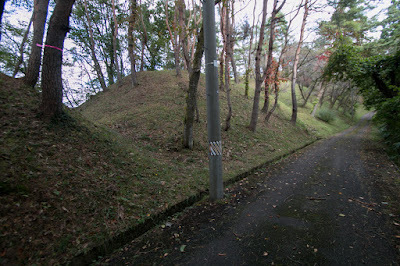 But after the death of Chikasue, reaction of the policy of the clan arouse. 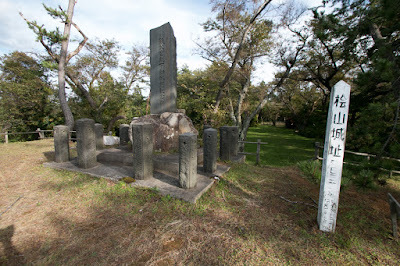 Sanesue Akita (1576-1660), son of Chikasue, was rebelled by former retainers of Minato Ando clan cooperating with Nanbu clan and Onodera clan in 1588. As Hirosaki area next to Noshiro area was held by Oura clan which left Nanbu clan, Sanesue disposed Wakimoto castle and besiege at Hiyama castle. 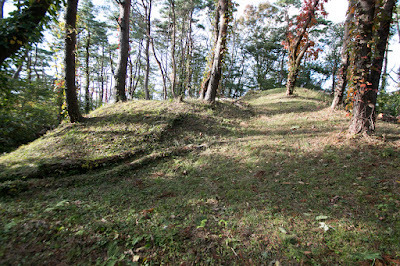 Sanesue had only hundreds of soldiers, but well kept Hiyama castle nearly half year and finally suppressed this rebellion. 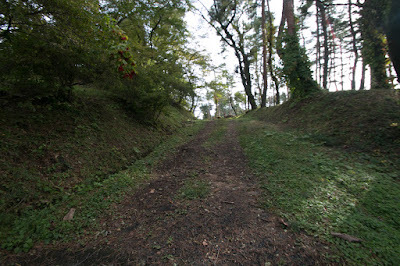 Akita clan could survive as a feudal lord under Toyotomi government, but was transferred to Hitachi province (Ibaraki prefecture) in 1602, as a result of battle of Sekigahara. 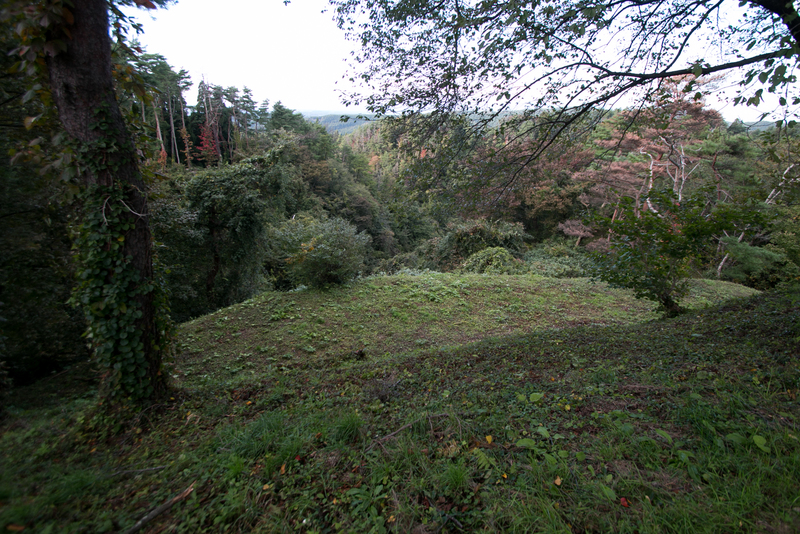 Akita clan later moved to Miharu castle (Fukushima prefecture) and survived as a feudal lord by the end of Edo era. 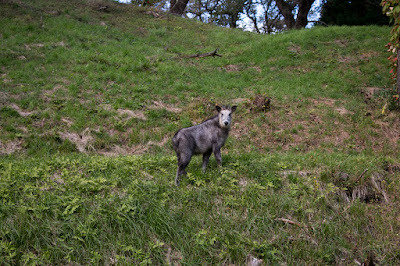 As a replacement, Satake clan which was the lord of Hitachi province resided at Mito castle was moved to Dewa province. 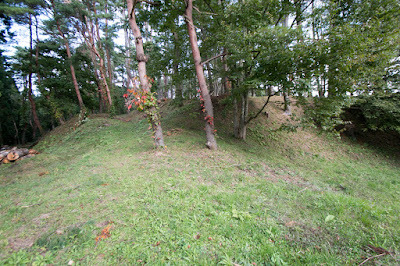 Satake clan built Kubota castle at current Akita city and resided there, and placed his important retainer Tagaya clan as the commander of Hiyama castle. 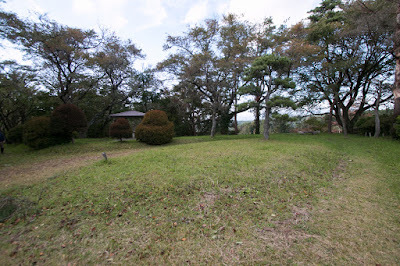 But became of Ikkoku Ichijo Rei (one domain one castle rule), Hiyama castle was abolished in 1620. 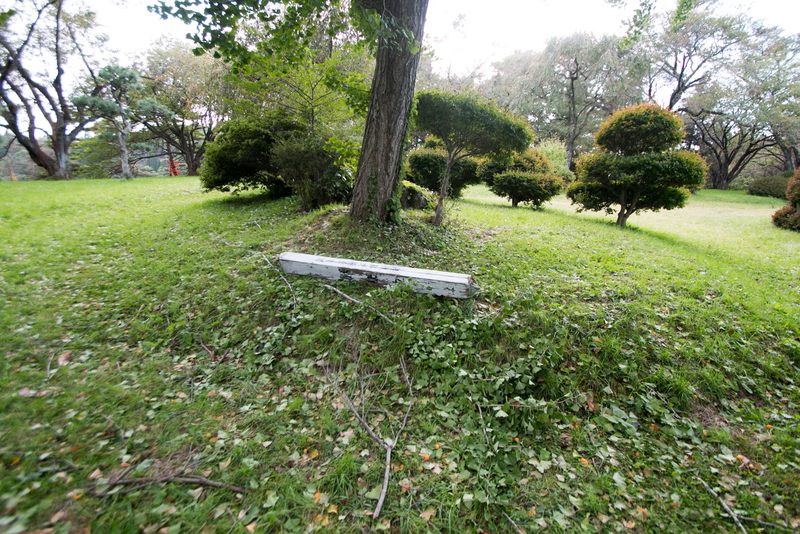 Now all building was lost, except for one gate remains at a temple near the castle. Formerly a gate remains at a temple near the castle was a ruin of the castle, but as a result of investigation it became clear that this gate was newly built after the abolishment of the castle. Huge and tough structures of the castle well shows past glory of Ando clan which was praised as the lord of sunrise direction, even though lost their original land and wandered to distant place. 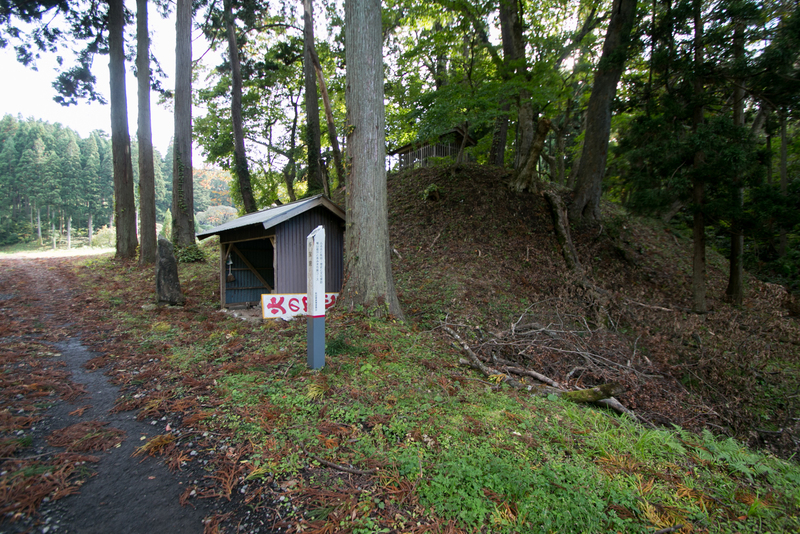 Hiyama bus stop of Shuhoku Bus from JR East Ou Honsen line Noshiro station or Higashi-Noshiro station (only 5 service per day and quite inconvenient). 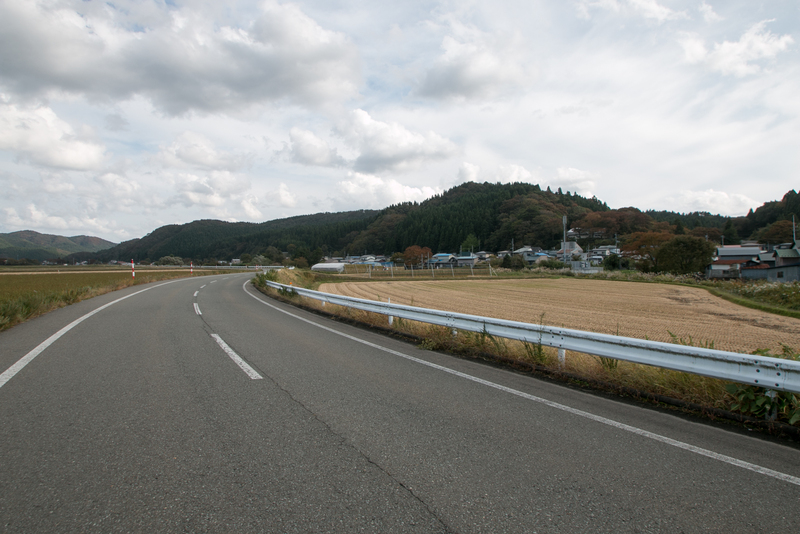 10 minutes drive from Akita Jidoshado Expressway Noshiro-Higashi interchange.